Woodrow's Pond closed Wednesday 17th April “Kids Event“ from 8am until 3pm. 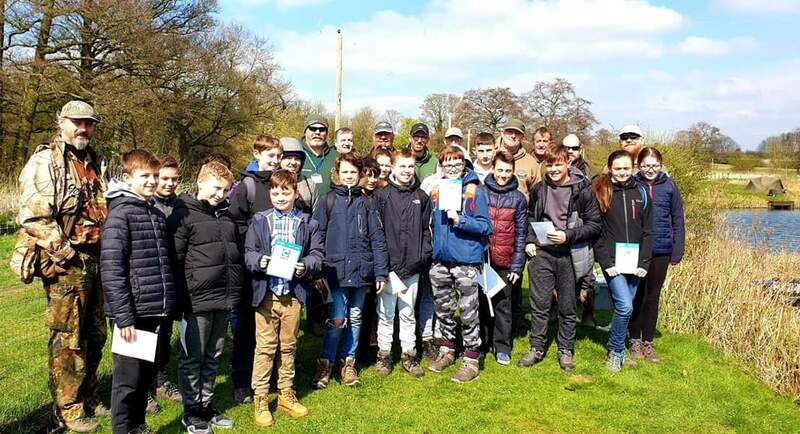 18 Scouts from the Chaddesden 132 Troop and the Darley Abbey 63 Troop participated in the Scouts’ Introduction to Angling Event which was held on Woodrow’s Pond. Whilst the fish were very uncooperative, the youngsters showed great application. All were a real credit to the Scouting movement in general, and to the two participating local troops in particular. As ever the hot dogs went down a treat. Each participant received a CAST Award Beginner Certificate, which is a marker point as they move towards achieving their Scout Angling Badge and Level 2 Cast Award. Big thanks as ever to our army of helpers who ensure that we can generally offer one to one angling tuition. Thanks to Richard, Andy (who again made the journey down from Sheffield to help), Dave Ship., Pete, Ken, Len, Kevin J., Kevin R., John W., John L., Dave P., Mark D, Mark R., Mike, Matt, Paul and Val. Thanks too to the Scout leaders Debbie, Dominic and Gareth. Follow up events for the Scout troops are being arranged (132 Troop June 8th, 63 Troop June 15th). The next general event for Junior Beginner Anglers (for both “newbies” and “developers”) is Wednesday 17th April, again at Woodrow’s Pond. Derwent Valley Fishery will be closed on Monday 8th April for Fishery Improvements. Woodrow's Pond - Saturday 6th April. 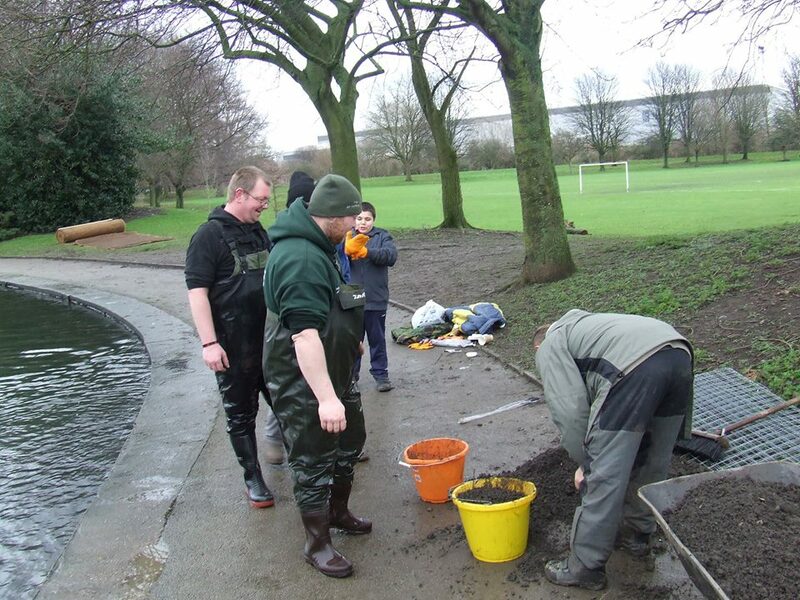 A reminder that the pond is closed for our 'Let The Scouts Go Fishing' Event until 3pm in the afternoon. 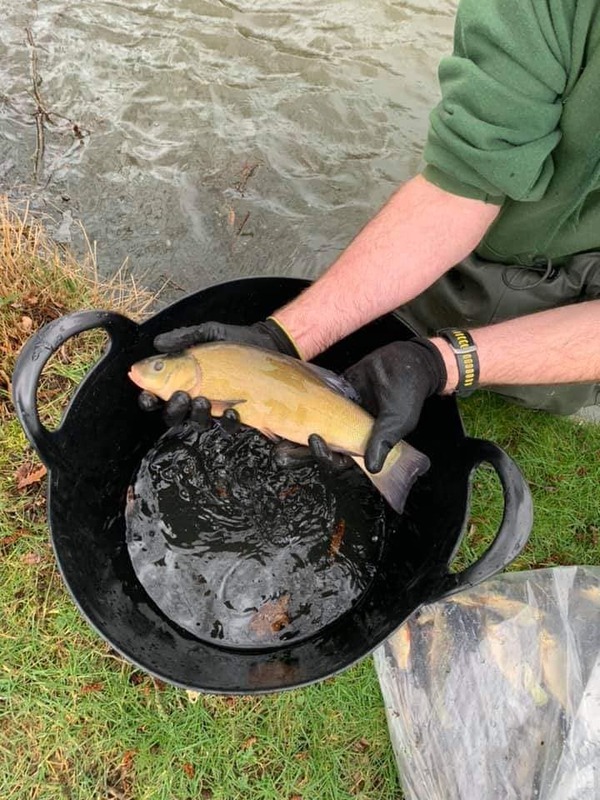 Farnah Lake - we have a vision to create a mixed fishery with an emphasis on Tench and Crucians and with this in mind a good number of these species have been introduced. 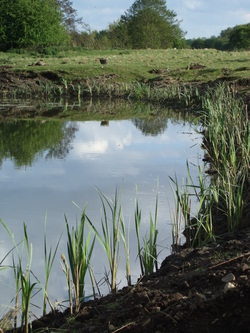 We aim for several improvements including bank repair, marginal habitat to include reed beds and also native white water lillies and peg improvements. Many thanks to AE Fisheries. Alot to do but onwards and upwards as always and will keep all updated when the work gets underway..
​Just a quick reminder that Allestree Lake is closed to fishing tomorrow Monday 1st April for maintenance. This won’t effect public access & the path around the lake remains open as usual. Apologies in advance for any disruption to the areas we are working in. The Earl took delivery of coir rolls yesterday for Markeaton Lake, which have been funded by WEIF grant from the Environment Agency. Thanks also goes to the Derbyshire Wildlife Trust. The rolls are to be installed in between fishing pegs (new peg fronts to be installed too) and the banks regraded and infilled by a digger. As evidenced by the photos, there is significant bank erosion (with banks undercut) and minimal marginal reedbeds / plants. The rolls will quickly develop into established marginal reedbeds, helping protect the banks, improve water quality, improve lake biodiversity and provide valuable protection for juvenile fish. The lake will look visually more appealing too. 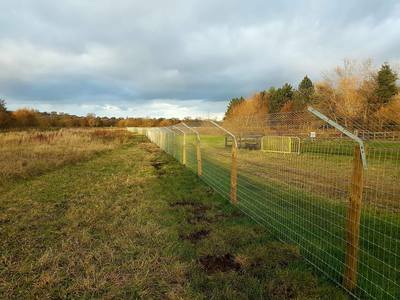 Priority was to take delivery and get the rolls into the margins and protected from grazing geese in temporary compounds. This achieved and we also installed our first 2 coir rolls. Big thanks Dave Parr, Dave Sharpe, Richard Froud, John Parr and Mark Dear. 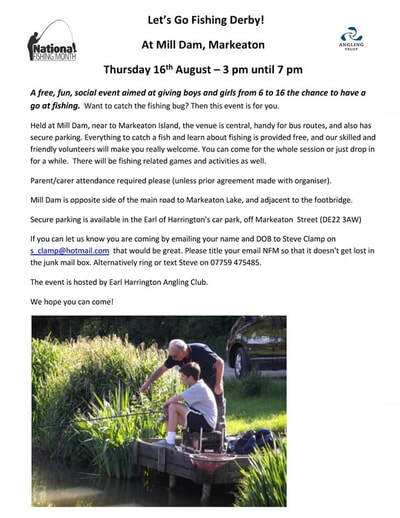 Listed below are a series of FREE angling events for boys and girls who want to have a go at fishing, or who want to improve their angling skills. Saturday April 6th "Let the Scouts Go Fishing"
10.30 am - 1.30pm - Woodrow’s Pond (just off Haslam’s Lane, Darley. Near Derby Rugby Club). 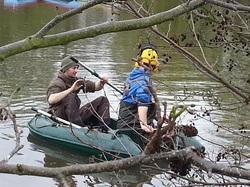 A bankside session for local Scouts. Counts towards the Scouts’ Angling Award and the Level 1 and Level 2 Angling Trust CAST awards. Wednesday April 17th "Let’s Spring Into Fishing"
10.30am - 2 pm - Woodrow’s Pond (just off Haslam’s Lane, Darley. Near Derby Rugby Club). The third follow up session for those who have attended previous sessions, but newcomers also very welcome. Please contact Steve Clamp to register, contact details below. Saturday June 22nd "Let’s Get Even Better!" 10.30am - 2pm - Woodrow’s Pond and adjacent section of River Derwent. 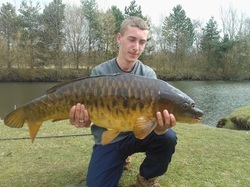 Angling workshops that develop a range of fishing skills including fishing with rod and reel, carp fishing and river fishing. Another follow up session for those who have attended previous sessions, but newcomers also very welcome. Please contact Steve Clamp to register, details below. All activities count towards The Angling Trust’s CAST Awards. Wednesday 21st August "Let’s Start Fishing 1"
2pm - 7pm - Mill Dam, Markeaton. A National Fishing Month event. Want to try fishing? If so these beginners’ events are for you. Lots of help on hand and great fun. Watch out for the posters or contact Steve Clamp – details below. Saturday 24th August "Let’s Start Fishing 2"
10.30am - 2 pm - Brewery Pond, Shardlow. A National Fishing Month event. Want to try fishing? If so these beginners’ events are for you. Lots of help on hand and great fun. Watch out for the posters or contact Steve Clamp – details below. Sunday 25th August "Let’s Start Fishing 3"
10.30am - 2pm - Woodrow’s Pond (off Haslam’s Lane, Darley). A National Fishing Month event. Want to try fishing? If so these beginners’ events are for you. Lots of help on hand and great fun. Watch out for the posters or contact Steve Clamp – details below. September "Let’s Try Canal Fishing" - Date to be finalised. Pride of Derby waters. Saturday 5th October "Let’s Go Fishing Again"
10.30am - 1.30pm - A follow up event for those who started fishing during the August Let’s Start Fishing events. 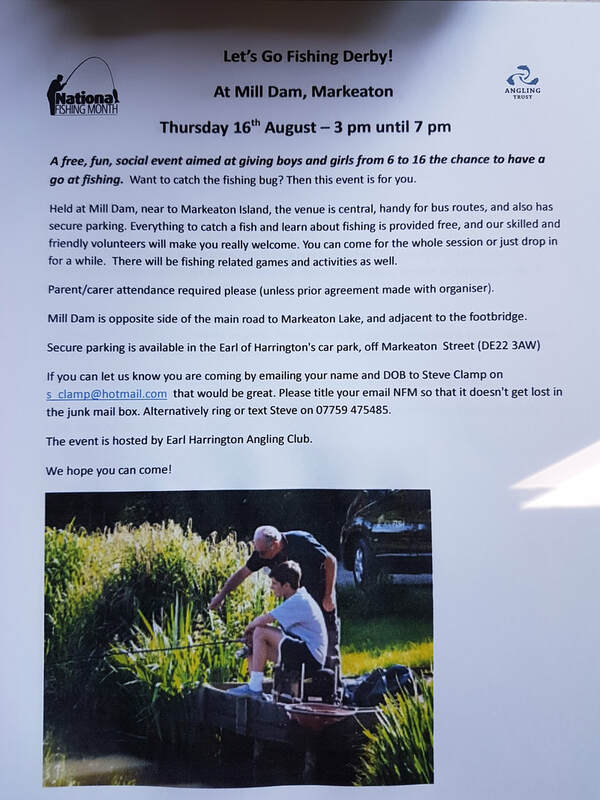 All events are co-ordinated and hosted by The Earl of Harrington’s Angling Club with active support from The Angling Trust, The Canal and River Trust , National Fishing Month, Derby Railway Angling Club, Long Eaton Angling Federation, and the Pride of Derby Angling Association. 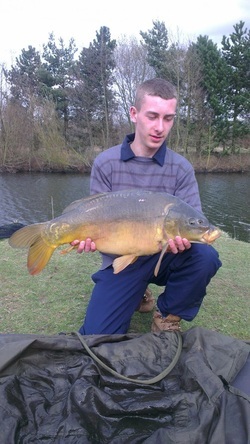 Active backing is also provided by Nathan’s of Derby, Fishermania and Julian’s Tackle. ALL PREMIUM TICKETS ARE NOW ALLOCATED FOR THE NEW SEASON AND A WAITING LIST NOW IN PLACE FOR 2020/21. SEASON TICKETS WILL BE AVAILABLE SHORTLY FOR THE NEW SEASON. WOODROW'S POND - due to ground conditions - strictly NO DRIVING AROUND THE POND. For the 2018/19 Season we have been raising money for local charity Sight Support Derbyshire SSD. Still not over yet as further sky dive money to come in (we will jump in 2019)! plus Final Predator Match of the Season on March 9th. As it stands today we have raised a magificent £2,928.00 including Gift Aid. Have high hopes we will certainly hit £3,500 which once again is amazing. Thank You to all that have contributed to this worthy chartiy ! We have 2 Kids Events taking place on Woodrow's Pond this week. The first one is this Wednesday (10.30 - 2.30) and also Saturday (10.00 - 1.30). The pond will be closed to any other fishing during these times. Great to see we are connecting with the kids! Heatherton Pond will be closed this Sunday from 7.30am - noon for Fishery Maintenance. END OF SEASON PREDATOR MATCH, SATURDAY 9TH MARCH - GET IT IN YOUR DIARIES. A follow up session to the successful Let’s Go Fishing events held in the summer is planned for Wednesday 31st October. The event will take place from 10.30 a.m. until 2.30 p.m. (but drop in and out is ok any time during that period) at Woodrow's Pond, Darley . For those that haven't been to this venue it is down a track off Haslam's Lane almost opposite Derby Rugby Club. In addition to the type of fishing we did in August we'll also be trying new techniques including casting with a rod and a reel, and, subject to conditions, safety and development level, spin fishing in the river. We'll also be recognising the developing skill level of the participants by providing access to the Angling Trust’s CAST awards. You don’t have to have attended one of the summer events to come. The weather at the end of October is likely to be very different to that that we experienced in August so we'll aim to be active! Today I want to thank Office Lake Fishery who have donated 24 hours for 2 anglers or 48 hours for 1 angler. Near Nottingham - Office Lake was dug out as a gravel pit in the late 1950’s early 60’s by the Hoveringham Gravel Company. During the excavations the remains of a mammoth were found and thus a mammoth was used as the firms logo. The lake was originally used by the management only (hence the name Office Lake). It is now being restored to its former glory and is available for specialist fishing and is very well stocked with The Wels European Catfish currently 70+lb, Pike, Eels, Perch, Rudd and Roach exist in good numbers and sizes too. IF YOU FANCY THIS PRIZE WITH ALL PROCEEDS GOING TO THE CHARITIES FOR LUKASZ'S MEMORIAL MATCH THEN GET IN TOUCH - RAFFLE TICKETS NOW AVAILABLE AT £2 A TICKET. WINNER WILL BE ANNOUNCED AT THE END OF THE EVENT ON SATURDAY 6TH OCTOBER. AVAILABLE BY PAYPAL TO teresa.parr@yahoo.co.uk and mark 'Office'. Also available on the day of the event. Fancy winning a 12 months magazine subscription to 'Improve your Coarse Fishing'? Raffle Tickets are £2 each via PayPal to teresa.parr@yahoo.co.uk and send as friends and family or Online Banking (email for details). All proceeds to RNLI and Air Ambulance in Memory of Lukasz - tickets will also be available on the day of the Charity Event on Saturday, 6th October with the winners being drawn at the end of the Match. Stand by yer bait tubs…..we have some match dates. All the matches are ‘Opens’ on Earl of Harrington club sections of the River Derwent. 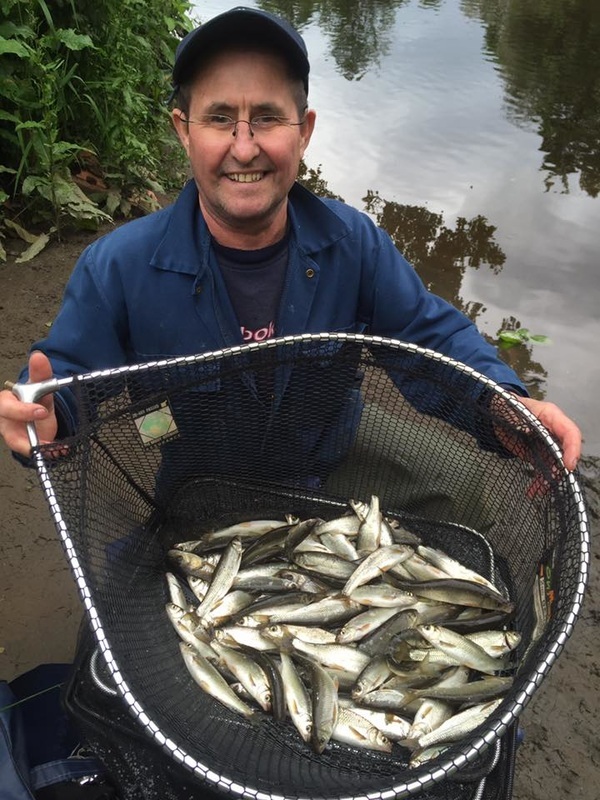 Sunday 30 September fishing Darley Park bank below the weir. Draw 8:00am fish 09:30 – 14:30. £13 all in. This match is limited to 15 pegs. To book on please contact Kev Hales on 07779 674997 or leave a message here. Sunday 4 November fishing the Deeps section. Draw 8:00am fish 09:30 – 14:30. £13 all in. To book on please contact Kev Hales on 07779 674997 or leave a message here. Sunday 25 November fishing Borrowash section. Draw 8:00am fish 09:30 – 14:30. £13 all in. To book on please contact Kev Hales on 07779 674997 or leave a message here. Sunday 16 December section to be decided. Draw 8:00am fish 09:30 – 14:30. £13 all in. To book on please contact Kev Hales on 07779 674997 or leave a message here. Sunday 23 December: Fur & Feather. Draw 8:00am fish 09:30 – 14:30. Venue and fees to be confirmed. 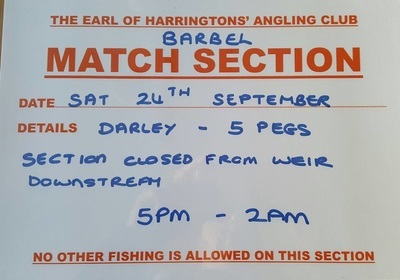 ​SATURDAY 15TH SEPTEMBER - The Annual Barbel Match is taking place over 3 stretches (Borrowash, DW and Darley) - It is a 30 peg match which will mean that Borrowash and Darley will be closed for the match from 4pm Saturday until 2pm Sunday morning. There will be some pegs still at DW but please observe the peg number reserved signs. Thanks. 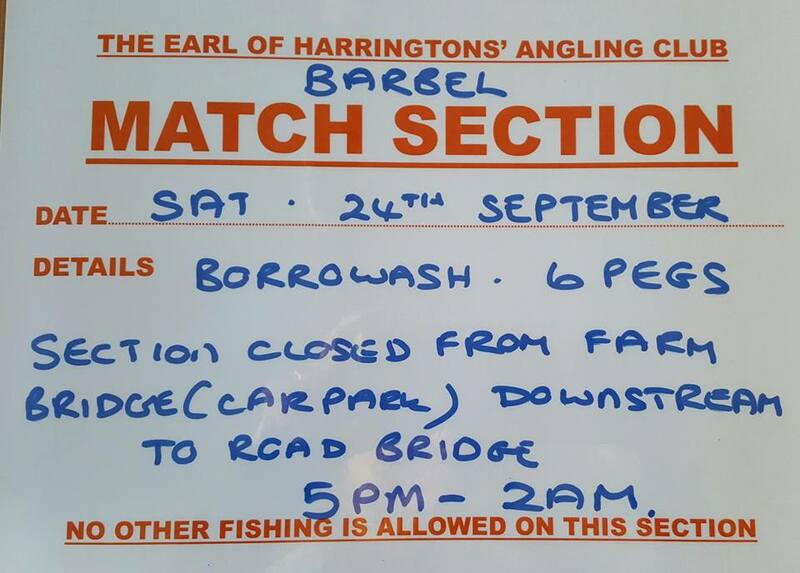 SATURDAY 15TH SEPTEMBER - The Annual Barbel Match is taking place over 3 stretches (Borrowash, DW and Darley) - It is a 30 peg match which will mean that Borrowash and Darley will be closed for the match from 5pm Saturday until 2pm Sunday morning. There will be some pegs still at DW but please observe the peg number reserved signs. Thanks. 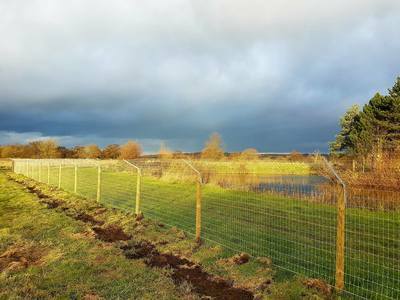 The aim of the project is to improve water quality and attract wildlife by increasing oxygenating plants and creating new habitats to improve the visual appearance and preserve the structure of the lake. Access will be restricted to certain parts of the lake while the works are taking place. We apolgoise for any inconvienance this may cause. First event of this kind on the Earl and am sure will now be an annual event. Very successful events at Mill Dam and Woodrow's Pond. Organised by Steve Clamp, Level 2 Angling Coach and our fantastic volunteers. Thanks to John Lock, Matt Lamb and Andy Ells for travelling down from Sheffield on Saturday. Also to any bailiffs that helped. If we have the volunteers, it means these events can definitely continue. Lastly, thanking the parents/carers and the children for coming along - without you it would have been rubbish! Hope you can come along and support - would be great to see you there - Full Details Below! It has been confirmed that Algae samples collected from Heatherton Pond by the Environment Agency contain potentially toxic blue green algae. Many waters are susceptible to this problem, typically between June and November. Please read the attached poster which will go up in several places tomorrow at the pond. Due to the confirmed outbreak of KHV at Coopers Lake and the high temperature / low water conditions we are experiencing, keepnets are banned on all Earl stillwaters with immediate effect and until further notice. Please act responsibly and dry out all nets in sunlight / open air thoroughly before fishing on any waters, anywhere. This is imperative to stop the spread of KHV and to protect fisheries across the region / country. Alvaston Lake will be closed for fishing from noon Friday (20th July) until Sunday at 4pm. It is the Annual Fun Day Match Weekend. Thanks. ​Woodrow's Pond will be closed from 5pm Saturday 14th July until Sunday 15th at 9am for an event. 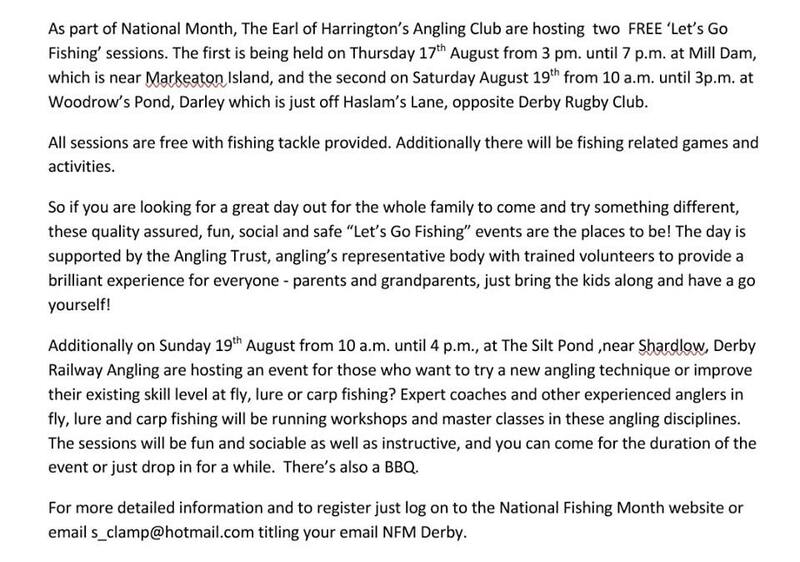 As part of National Fishing Month, the Earl is hosting two fun, social events aimed at getting more youngsters involved in our wonderful sport. Everything to catch a fish and learn about fishing will be provided free. 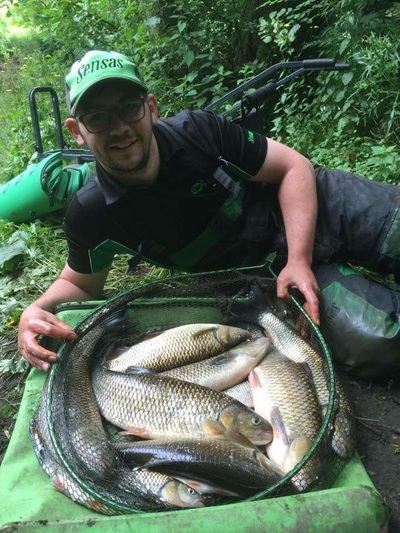 There will be at least one Level 2 Coach at the sessions supporting the event under the Angling Trust "umbrella" alongside volunteers who will show newcomers what to do. Youngsters and their parents/carers can come for the whole session or just drop in for a while. We will be aiming to arrange fishing related, bankside games and activities as well. The first Let's Go Fishing Derby event is at Mill Dam on Thursday 16th August from 3 pm until 7 pm, and the second on Saturday 18th August at Woodrow's Pond from 10 am until 3 pm. Heatherton Pond is now re-open after spawning. Our randy fishies have decided they need a second helping of loving this year. For that reason Heatherton Pond is closed again for spawning. They seem to be favouring multiple short spells this year so we will keep a close eye on thing and reopen as soon as possible. Your cooperation is appreciated as always, spawning is a stressful time for our stock, the last thing they need is anglers trying to capture them. Saturday 30th June sees our Annual Match Fundraiser (Fancy Dress Optional) at Allestree Lake. £20 entry and all proceeds to our Charity of the Season Sight Support Derbyshire SSD. There are still places available so get in touch if interested. This is open to Non-Members and the whole concept of the day is to raise money and have a good day out. 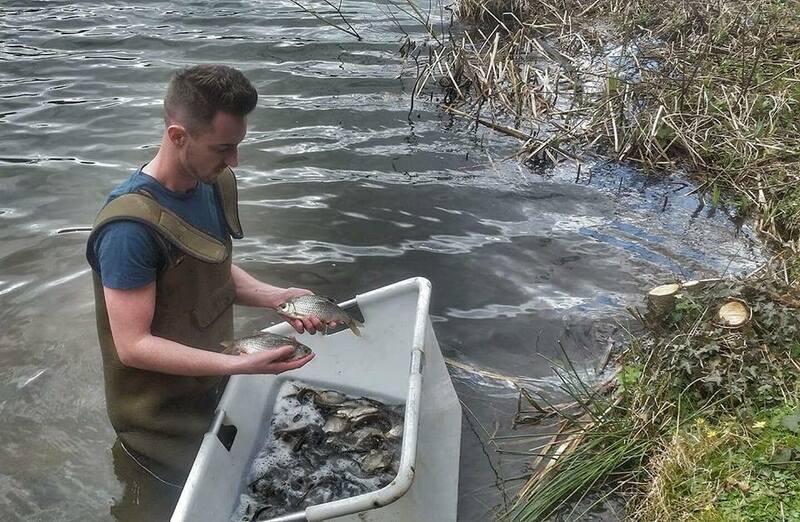 2 Rods - any species - keep nets allowed for smaller silvers. Small prize for winner - Contact via, email, facebook or Teresa on 07891 547968. It is regrettable that we must inform our members that Heatherton Pond has been subject to an Otter “attack”. Over a period of 1 and a half weeks starting on Sunday January 13th we have lost 6 of our beloved carp with a weight of circa 8 - 14lb. We also lost at least 3 adult water fowl. From our recent netting we have been able to get a fuller picture of the damage caused. We have one fish that has major otter damage and a very small handful that have minor tail fin damage, all of the damaged fish are still swimming strongly. The very high majority of stock remain untouched and in absolute pristine condition. As many will be aware, the UK Native Otter is a European protected species ( EPS ) and is also fully protected under Schedule 5 of the Wildlife and Countryside Act 1981. You're breaking the law if you: capture, kill, disturb or injure otters (on purpose or by not taking enough care). This very much left the Heatherton and wider Earl of Harrington teams with tied hands. The only options we had available were to survey and deter. We were quick to find the route in and out of the Pond said Otter was taking. It didn’t take long to find very distinguishable paw prints along the brook that runs parallel with the pond. Within a day or two we had setup motion detecting cameras, within a short period of time we had captured the Otter entering the pond in the early hours of the morning. We were also quick to clear the thick growth on the Island which the Otter was using to eat it’s catch. Heatherton was the last place we expected to see an Otter given the distance from the nearest river but it has happened. We are truly devastated. This isn’t anybody’s livelihood per se but thousands of volunteer hours have gone into HP and it’s stock, this is our passion and our love. In some cases, lives revolve around Heatherton Pond. To say that the lakes management team were hit hard is an understatement. 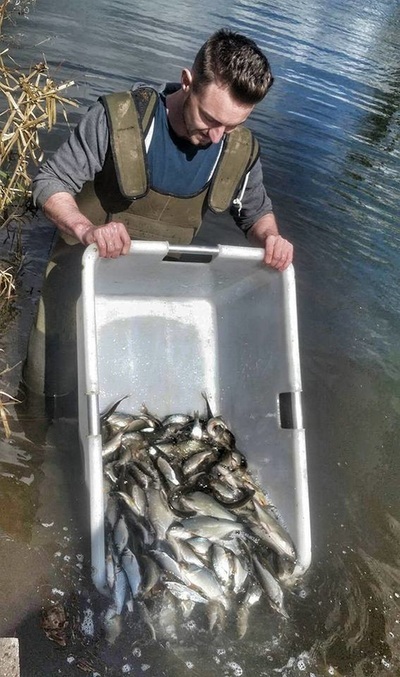 The timing could not of been worse, for the past 12 months+ the Heatherton team had been planning to thin out the Biomass with the purpose of growing on large fish. We had already made steps towards this goal with our first netting survey. We had already agreed as a committee and a team that the moving of 35 fish was what was needed to realise this plan. This threw a huge spanner in the works and made us re-evaluate the situation. First and foremost, it was decided that not a single fish would be removed until we were confident that the Otter was no longer visiting Heatherton Pond. Eventually the killings stopped and there were no sights to be found on the cameras that had been setup. After a lot of consultation, we opted to lower this number to 22 - well in excess of the 6 carcasses that have been found. To put this in perspective, our fishery management consultant had advised us to remove 50% of our stock (100 fish) to grow on large carp advising this should not have an adverse effect on the number of fish put on the bank. It is very unlikely that an otter will ever take up residence in the area due to people and dogs and the visit is very likely to be an otter travelling further away from its natural habitat to find food, very likely due to high winter river conditions on the Trent at the time. As such, a visit is likely to be on a very infrequent basis. Moving forward, we are in talks with Derby City Council on whether an otter fence is going to be possible, if we get permission, it will go up - no question. However, being a city park area, we’re unsure at this stage whether this is a feasible option. This leads onto the current legal and legislative position we find ourselves in as a fishery management team; in regards to the European Otter, the fact of the matter is humans have caused this problem that fisheries all over the UK are currently facing, Humans need to fix it. The current legal stance is simply unfair. We implore you to look up the Predation Action Group (formerly spearheaded by Tim Paisley), support their movement and get involved. Our community needs to get together to make change. 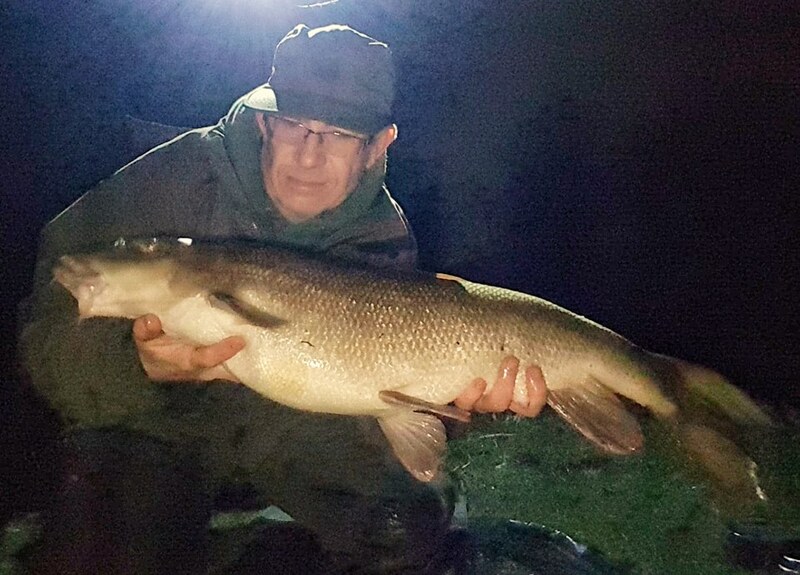 Superb 15lbs 4ozs Barbel for Wayne Tooth yesterday - Pristine condition - well done Wayne! The next club match is due to take place on 11th February 08:00am draw, fish 09:30-14:30. The section of the river to be used will be the cutting at Borrowash, pending river levels. If you wish to book on the match please contact Kev Hales on 07779 674997. The costs for the match is £13 all in. There is also a match planned for 25 February..
​The Earl of Harrington's AC would like to take the opportunity of thanking the Angling Trust for awarding the Club a grant of £5,000 towards the erection of Otter Fencing on Haslams Lake at Derwent Valley Fishery. The Award is part of the Angling Improvement Fund - Round 1 (2017-18). Our successful bid was put together by Dave Parr (Club Secretary) and thanks to you Dave for all the hard work. £5,000 is a massive help to our 'not for profit organisation' so many many thanks again AT! ​KEEP NET BAN ON EARL WATERS - With immediate effect, the ban has now been lifted. Please ensure all of your equipment is bone dry before fishing on any of our waters. Thanks for your co-operation in protection of our fisheries. The Earl's inaugural Grey Lady tournament reached its conclusion last weekend. 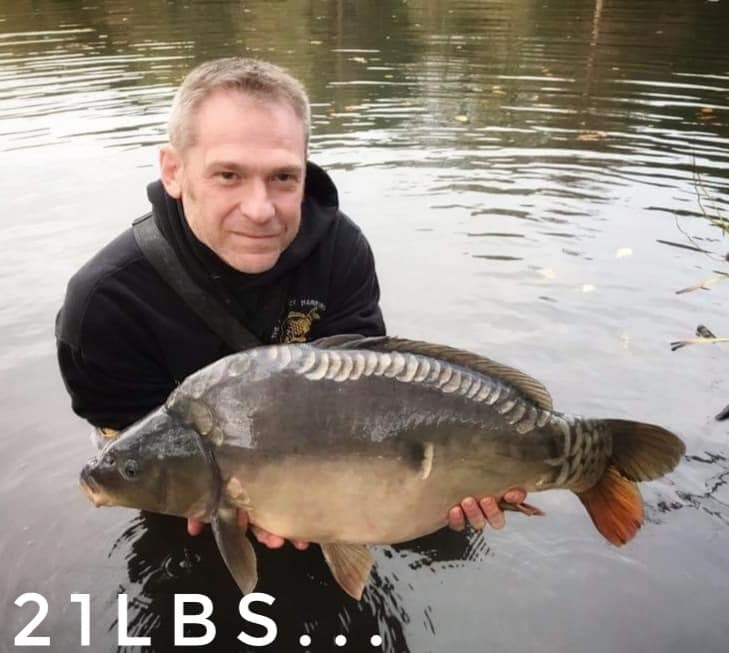 A huge congratulations go to Roger Boocock who left everyone standing in the final, setting the pace with a stunning haul of 3 fish for a total or 48lb 2ozs. No one else came close. 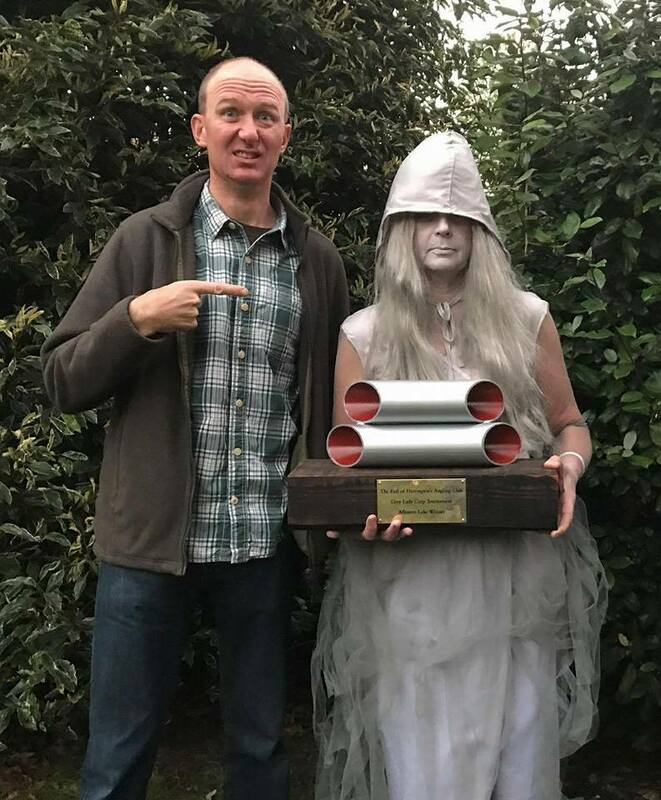 A very special guest emerged eerily from the mists to award the trophy which seemed a most fitting conclusion to this wonderful competition. Thanks to all the competitors who took part & made it all so much fun. The Grey Lady is proud of you all. The event would never have taken place without the dedication of Graham Spencer who put his heart and soul into making this a success - thank you Captain. We aren't just a fishing club for sure! GREY LADY COMPETITION - Allestree Lake will be closed to other anglers this weekend for a period of 48 hours from 4pm on Friday 27th October. Sincere apologies for any inconvenience. Massive thanks and respect to Graham Spencer for organising the Competition. Please feel free to wander round & join in the ‘spirit’ of the occasion. Who dares contemplate the haunted happenings & ghostly goings that might occur around the Lake on the run up to Halloween? For almost 2 centuries she has walked the mists of this most haunted of lakes & we hope to bump into a few of you there... CARVE A PUMPKIN AND BRING IT DOWN! The next Earl Club Match will be on 29th October, on the Cutting section of the river at Borrowash. Draw at 8:00am, fish 09.30 – 2.30pm £13 all in. BARBEL MATCH THIS SATURDAY - Please be aware that Borrowash section (road bridge - farm bridge) will be closed from 5pm until Sunday morning, also Darley Park side from Weir downstream and there will be 14 pegs at DW in the match also..
PARK IN LARGE LAY BY ON THE MAIN WIRKSWORTH ROAD (ON THE RHS AFTER YOU PASS CROOTS FARM SHOP WHICH IS SIGNPOSTED ON THE LEFT), COMING FROM DUFFIELD. EARL SIGN ON THE GATE OPPOSITE THE LAY BY. THERE IS OUR LOCK ON THE GATE, PEDESTRIAN ACCESS ONLY AND PLEASE ENSURE THE GATE IS KEPT LOCKED AT ALL TIMES. IMPORTANT!!! 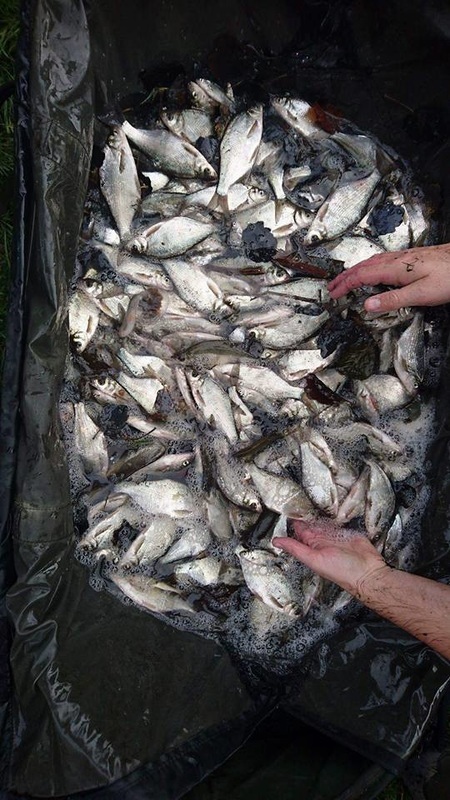 - Due to confirmed KHV virus at Birch House Lakes, Ashbourne (aka Brailsford) - KEEP NETS ARE BANNED WITH IMMEDIATE EFFECT ON ALL EARL STILLWATERS. Please ensure ALL equipment is BONE DRY before each session to include nets, unhooking mats, cradles, chest waders etc..
​ALVASTON PARK LAKE - Just to inform you the lake is Closed for fishing from this Friday evening until 4pm on Sunday for a Match. 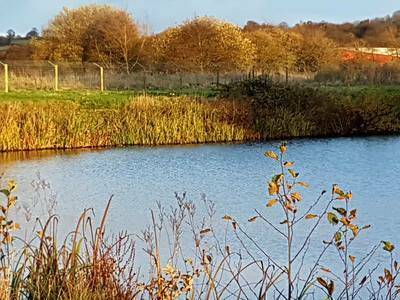 The Earl is pleased to announce that Farnah Lake, which is a mature lake and mixed fishery, near Duffield is our new acquisition. The lake is owned by The Kedleston Estate and is set in beautiful rolling park and countryside, overlooking the Ecclesbourne Valley. We believe it used to be a great Crucian Fishery. Stocking levels need to be established but the lake is very turbid which is a promising sign of good stock levels. As soon as essential peg/bank/tree work has been carried out, we will open it up to members (no day tickets). Improvements will be ongoing and will keep you updated - further information to follow. We are hosting our first Kids Fun Day a week on Saturday (19th August) at Woodrow's Pond. Non-members welcome and all children must be accompanied by an Adult. Interested? Then get in touch by Thursday 17th August to register, either by messenger or email to earlofharringtonsac@gmail.com. 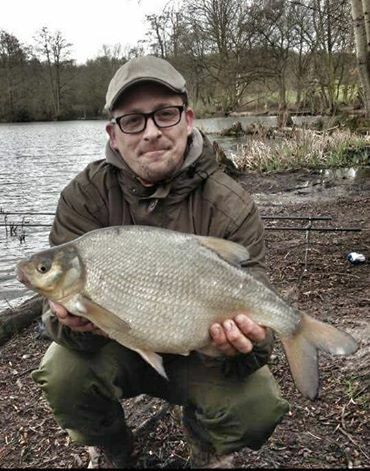 Monster PB Chub landed at the weekend to new member Robert Mitchell. A fine specimen at 7lbs 1ozs.. This Saturday, 15th July is the Annual Facebook Match which is being held on Woodrow's Pond. There are a few spaces available, so if you are interested, then email Teresa at earlofharringtonsac@gmail.com. THE POND WILL BE CLOSED UNTIL 4PM. ALL OF THE STILL WATERS ARE NOW OPEN FOLLOWING SPAWNING - THANK YOU FOR YOUR PATIENCE! The whole day is about raising money for the Neo Natal Unit at Derby Royal - many thanks and hope to see you on Saturday..
Alvaston Lake will re open for fishing on Wednesday, 7th of June. If you do see Carp Spawning again, please give them the respect they deserve and don't cast to them and contact the Earl immediately. The Lake will close again if necessary. Rod licences are not needed for children up to 12 years old. 12-16 years a rod licence is needed but they are Free. ALVASTON LAKE IS STILL CLOSED FOR SPAWNING - WILL KEEP YOU UPDATED. 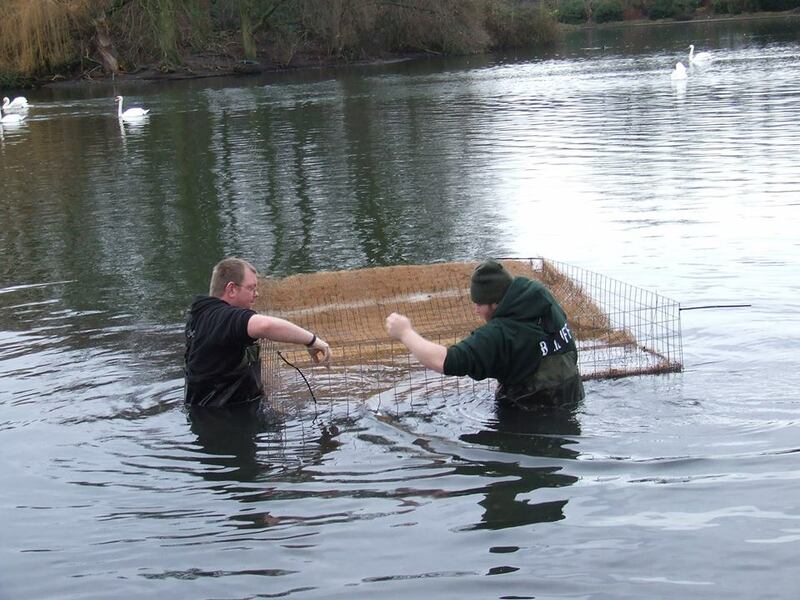 ALVASTON PARK LAKE AND WOODROW'S POND ARE CURRENTLY CLOSED FOR CARP SPAWNING. WOODROW'S POND - 4 more platforms have been installed, 2 of which have "opened up" new fishing areas. 3 more platforms still to be installed and also a bit of "finishing off" to be completed. Woodrows is becoming a real gem - look great and starting to fish very well. Thank you Dave Parr, Paul Cockerham, John Wheway, Daniel Moore, Lee Foster, Dave Sharpe for giving up your Friday - a great team! Big thank you to the Environment Agency for supplying them - funded from rod licence money! Member Brett Johnson was happy to say the least, when he spotted signs of carp feeding at Markeaton Lake last weekend. He fetched his stalking gear and within 20 minutes landed his PB at 24lbs 2ozs. Massive well done Brett! All the hard work by our committed and dedicated team of volunteers is paying off on Woodrow's Pond. 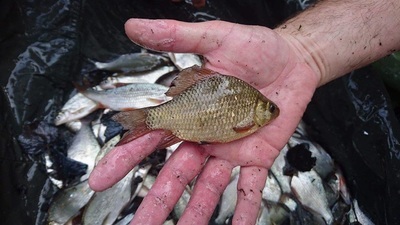 Investment over the last few years into habitat improvements (to improve spawning, provide refuge for juveniles, increase levels of "naturals" and protect the banks) has resulted in increased numbers of "silvers". Installing ropes across the pond last November has stopped cormorant predation as far as we can see (no cormorants have been evidenced on woodrows by our bailiffs since). A number of members have enjoyed successful sessions over the last few weeks, the latest being John Lock who enjoyed a busy short session on Tuesday evening, landing 11lbs of silvers and a 3lbs Bream. Well done all involved and well done John. Carl Ellis had a great session on Woodrow's. The pond is coming on well and the ropes are certainly having a positive effect. The fish are certainly becoming more confident.. Loads of perch landed, dozen stockie tench, some lovely rudd and a gudgeon... Great! Contractors are clearing remaining materials this week out of the car park so just be aware if parking your car.. DATE FOR DIARY - THURSDAY 20TH APRIL - The Earl welcomes any member (Premium/Season) to our 104th Annual General Meeting - Venue is Alvaston Park Community Room by the car park for a prompt 8pm start. Hope to see you there! The 31st March saw family and friends remembering Jason 'Porky' Ward on the first anniversary of his passing. 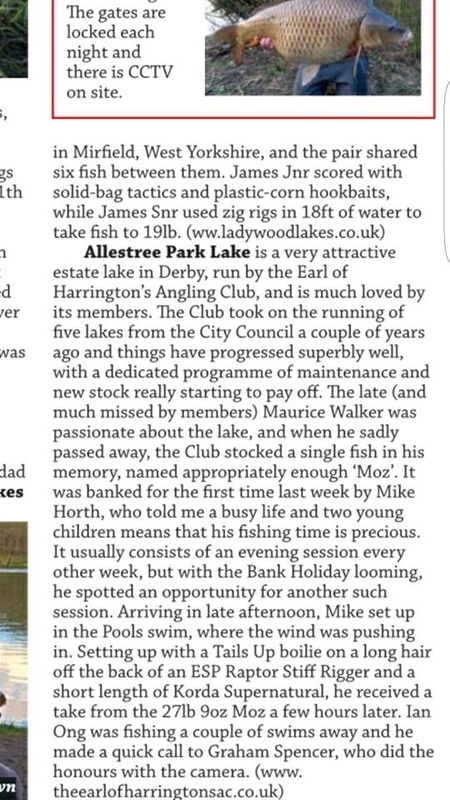 It has been a difficult 12 months for many but the Earl lads wanted to remember him by having a Memorial Match on Porky's beloved lake - Alvaston Park Lake. Steven and Emma arranged it all and 10 Anglers took part in this 48 hour Match. £20 entry and pay out to 1st, 2nd and 3rd unless on the off chance that Porky Carp graced the bank, then the captor won all. 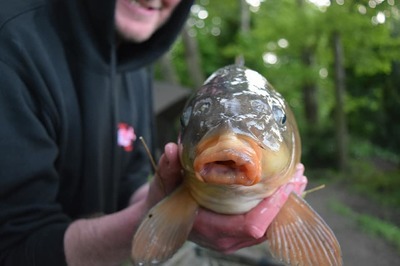 Porky Carp was introduced last November into the lake and hasn't been seen since. Guess What?!! He made his first appearance on the match and Chris Martin was the angler to do it - special times indeed. It was a great weekend with quality fish being landed. Personally, am honoured to know these lads Same time next year? 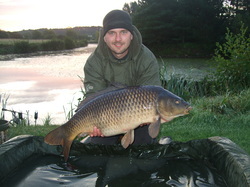 Stunning 18lbs 9ozs Common out of Woodrow's Pond at Derwent Valley Fishery on Saturday. Well done Paul Cockerham! 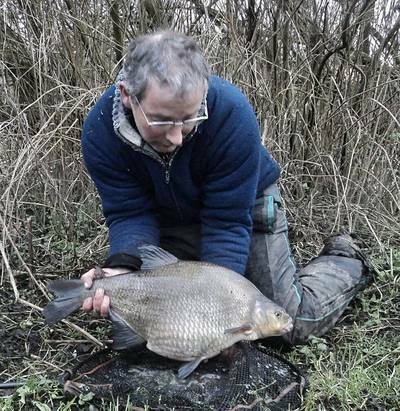 The Bream in Markeaton Lake are fine specimens and have been landed at 13lbs+ . Ben Corbett had a session on Saturday and landed 5, biggest going 8lbs 5ozs. 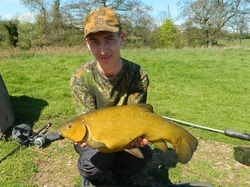 Ben also landed his first 20lbs Carp of the season as well. A good day's fishing! 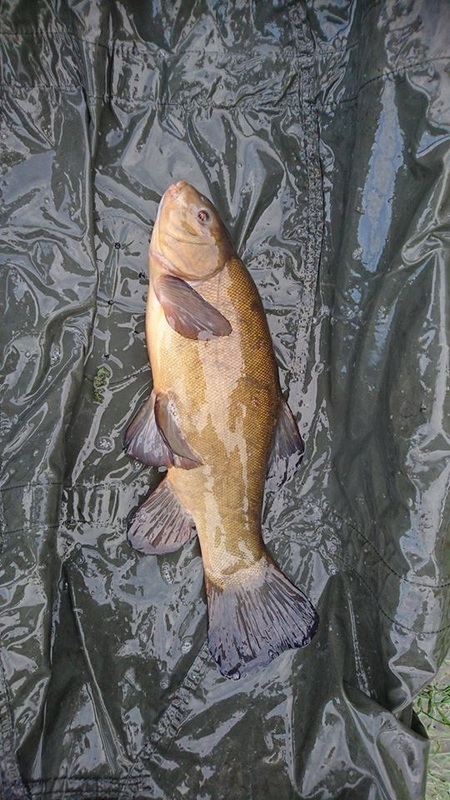 The 'Deeps' Section certainly came up trumps at the end of the river season to include a 'life time Perch' at 5lbs 5ozs and cracking Tench at 5lbs 7ozs. Both were landed by Lee Bennett, which won him the end of season match. The next day saw Chris Anthony fish the stretch and landed 2 PBs - 2 Chub at 5lbs 6ozs and 4lbs 8ozs, followed by 2 Tench at 5lbs and 4lbs 14ozs. Chris also lost a stunning mid double mirror carp but was still thrilled to bits all caught on good old lobworm! What a fantastic way to finish the season. Well done to both of you! 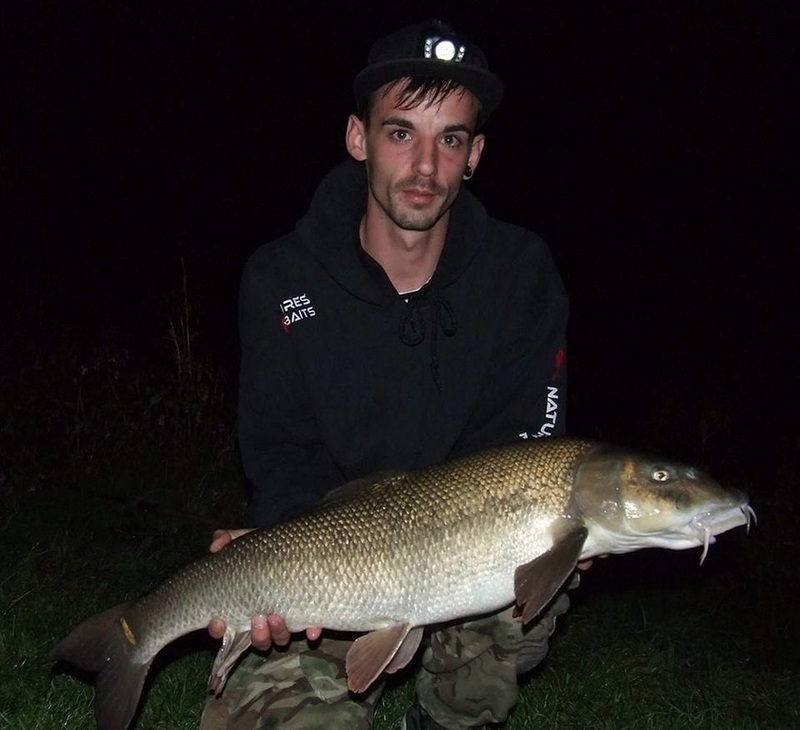 Club Member, Thomas Walker was over the moon to land his PB Barbel on the last day of the river season. Weighing in at 13lbs 1ozs. 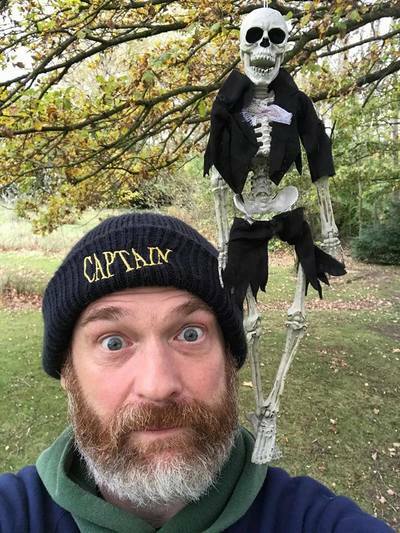 Fine Specimen Tom - well done! Due to the imminent closure of Mad Hatters Cafe at Alvaston Park, day tickets are no longer available there. As soon as the new café is up and running, Day Tickets will be available. Nearest tackle shop is Fishermania or buy online. 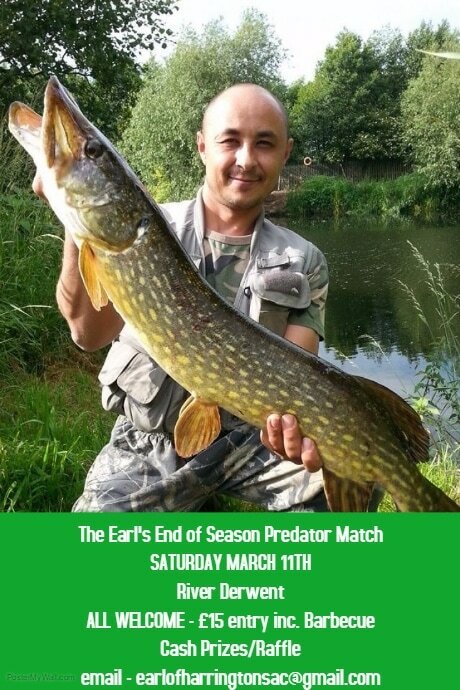 THE EARL'S END OF SEASON PREDATOR MATCH - SATURDAY 11TH MARCH - RIVER DERWENT - 8AM - LURES/DEADBAITS - ROVING/STATIC (UP TO YOU) - £15 to include Barbecue at end of match..
17/18 Season Tickets prices remain the same and will be available to buy online through the website this week and will be out to tackle shops the beginning of March (new Earl season begins 15th March) - All season tickets require photo id to be stuck into inside back cover before first session (we have had a number of occasions of members passing ticket on). Also you will require a padded unhooking mat if you are fishing any of the stills - these are available from as little as £6 from local tackle shops. Thanks to all for your support this season. 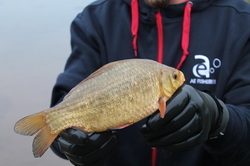 First outing for John at Alfreton Angling on the river for a few months and he found the bream on the feed on a short 3 hour session. 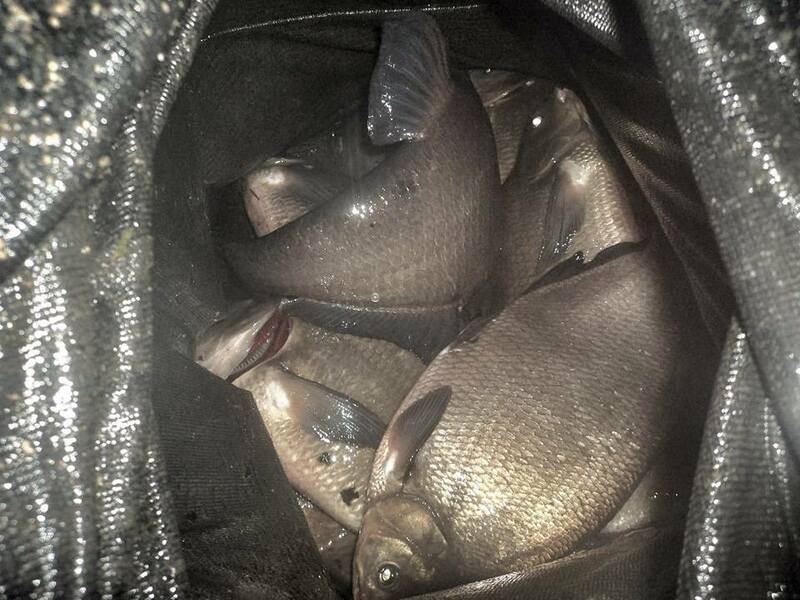 11 bream landed with all the fish bar 1 weighing between 7lb and a first double of 10lb 2oz. River was still about 1ft up with a nice colour . 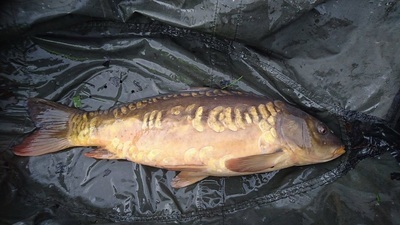 All fish came to a groundbait feeder, 1.5oz of lead, 4lb reel line, 0.15 dia hookline and a 16 hook with 2 red maggots on. Well done John! On a sad note; many Earl members may know or remember Norman West. 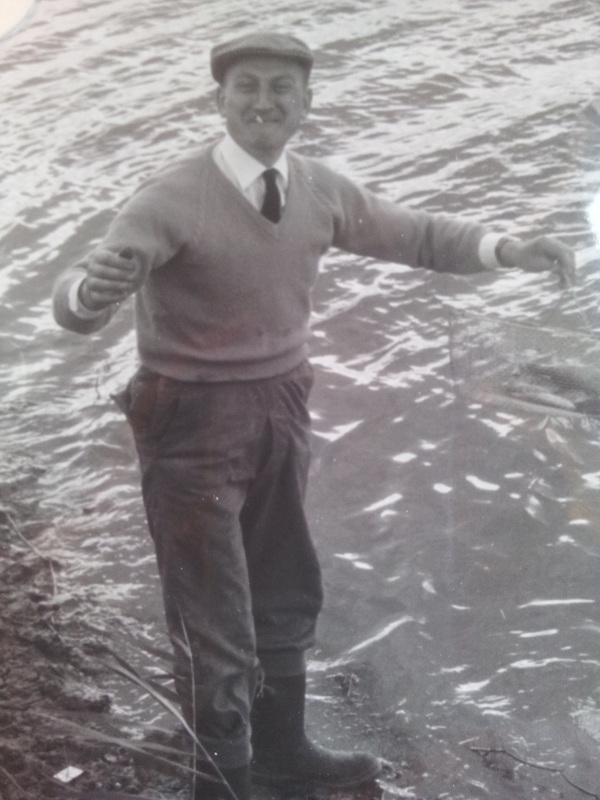 Norman passed away on 10 January and his funeral will be a Wilne Church on 10 Feb at 10:30. When I first joined the Earl, my first trip was to the culvert peg on the cutting, going back to around 2002/3. Norm was the first other member I met, I had a rare red letter day as I had just come back to fishing after a 20 year break. Norm was full of advice, really helpful and a proper gent. He enjoyed his trips to Holland with other club members and I took his place when he could no longer go. Season Tickets/Day Tickets 2017/18. Once again there will be no increase in ticket prices. We have had instances of members passing tickets on. In this respect ALL Season Tickets will require an ID photo in the inside back cover. It will be your responsibility to sort this and the ticket will not be valid until done. Thanks. 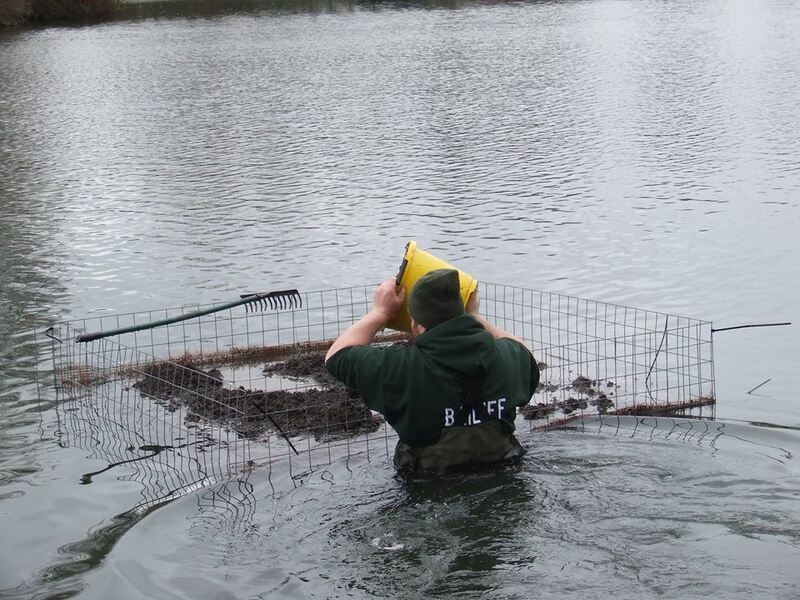 The temporary keep net ban on the stills has now been lifted - also with immediate effect keep nets are now allowed on Woodrow's Pond. The new 17/18 ticket will be amended accordingly. Always make sure your nets and unhooking mats are bone dry prior to your session. Thanks. Nice Surprise for Greg Clark today, fishing the waggler with maggot. A 10lbs 14ozs Barbel took a liking to his bait. Well done Greg! The next Earl Club Match is the Fur and Feather on Sunday 18th December. Draw at 8:00am fish 9:30-2:30. We will announce the stretch nearer the time pending river levels. Entry is £20 + £13 peg and pools. 5 peg sections, pay out for each section winner. The entry fee must be paid by 14 December. 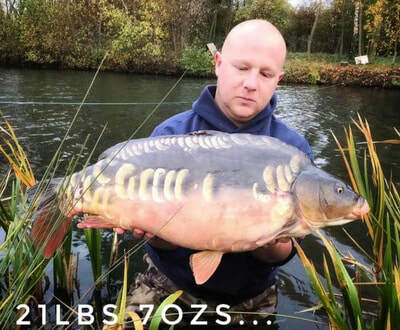 In memory of Jason Ward (Porky) - money raised for the introduction of 'Porky' at 20lbs 7ozs into Alvaston Park Lake..
ALVASTON PARK LAKE - Please note that the lake will be closed for fishery managment from tomorrow 2nd November and will re-open Saturday 5th November. We apologise for any inconvenience caused. 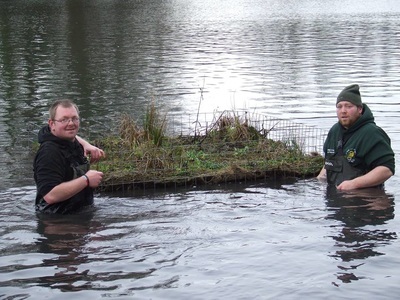 ​Last Saturday saw Woodrow's Pond Closed for Fishery Management and the main activity of the day was to survey the Pond by netting. It was hugely successful and extremely promising to see a huge amount of silvers present (easily 500lbs +), along with Bream, Tench, Carp. 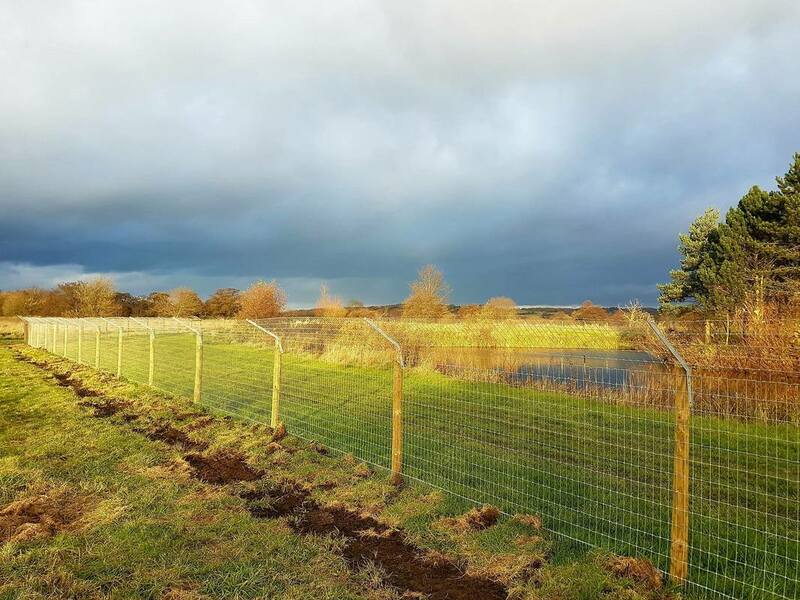 We will be installing ropes in the very near future to protect the stock from predation (Cormorants) and will continue a feed programme. The Environment Agency are also giving the Club a further 7 platforms so these will be going in as well. 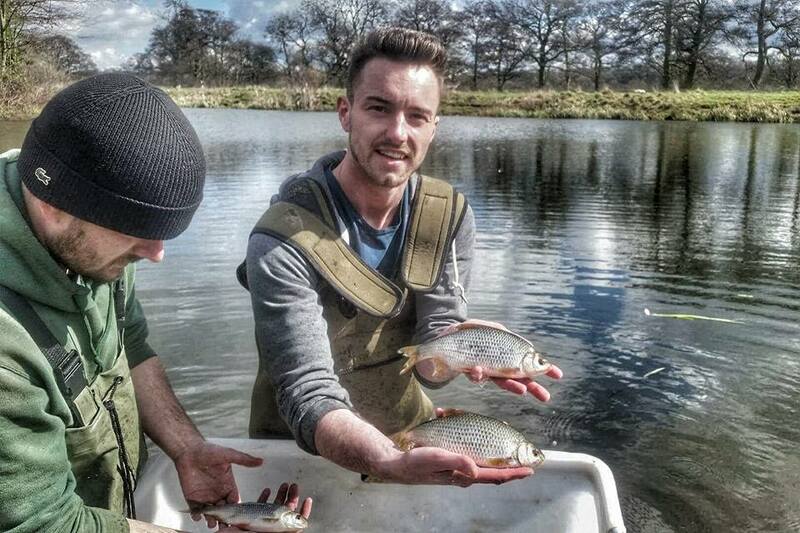 Our aim is to see these silvers grow and for the pond to be a great mixed fishery. Thanks to anyone that helped on the day. 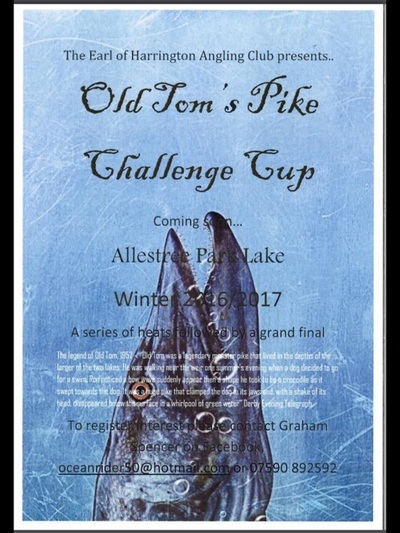 This Sunday is the first round of Old Tom's Challenge Cup at Allestree Park Lake. Still places left if you fancy it! - 2 sections will be closed as per map below. Thanks. The Earl's Integration Predator Match takes place tomorrow on the river between River Gardens Weir and Borrowash Road Bridge. The stretch is NOT closed. Still time to come and join in the day. Registering from 8am in the Parlour Car Park and £15 entry. The Earl has organised for members an evening with Ryan, EA Fisheries Officer at the Environment Agency. To be held at Alvaston Park Community Room on Wednesday, 12th October (7pm - 9pm) - Topics to be discussed are Predation (Otters/Mink/Cormorants), Signal Crayfish, KHV Virus and any topics members would like to find out more about. This is your chance to come along, to gain a better understanding and to ask any questions. 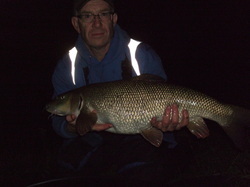 If you are an Earl Member then we welcome you to come along..
Monster Barbel landed by Ray Williamson last night - 17lbs! First year we have split it over Borrowash, DW and Darley Stretches and it proved much better all round. It went right down to the wire and it wasn't until 1.55am Sunday morning that we knew that Shane Tooth was the winner. 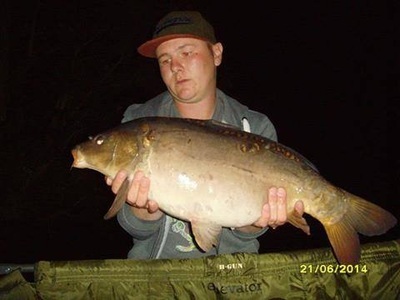 Shane landed 2 beauties at 12lbs 8ozs and 11lbs 8ozs out of Borrowash Stretch. He won £140 plus a further £50 for the biggest fish. 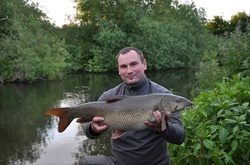 2nd was Richard Fielding with 3 Barbel from Darley (5lbs 12ozs, 7lbs 7ozs and 9lbs 2ozs). Richard went home with £90. 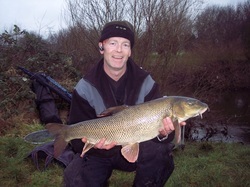 Gregory Clarke was 3rd with 2 Barbel from DW (6lbs 5ozs and 7lbs 11ozs) and won £60. Joe Sampson was 4th. £50 has gone to Club Funds and £50 to the Earl's Charity. It was a great night for Chub Fishing and over a dozen were landed. 2 PB's - one for Jak at 4lbs 5ozs and Gary at 4lbs 2ozs. Some good specimens out and although a Barbel Match, they were more than welcome. Hope everyone enjoyed themselves. Thanks to the guys that helped prepare the pegs and for the stewards on the night - couldn't do it without you. See you again next year! 3 STRETCHES AFFECTED FOR THE BARBEL MATCH THIS SATURDAY. The Earl has organised for members an evening with the Environment Agency (Ryan, EA Fisheries Officer). Topics to be discussed are Predation (Otters/Mink/Cormorants), Signal Crayfish, KHV Virus and any topics members would like to find out more about. This is your chance to come along, to gain a better understanding and to ask any questions. If you are an Earl Member then we welcome you to come along.. 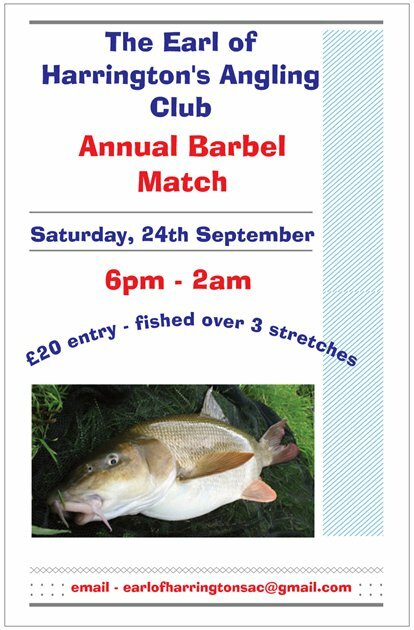 ANNUAL BARBEL MATCH, SATURDAY 24TH SEPTEMBER - PLEASE NOTE THAT THE MATCH IS BEING FISHED OVER 3 STRETCHES THIS SEASON. THERE WILL BE 8 PEGS TAKEN AT BORROWASH (FROM ROAD BRIDGE), 8 AT DARLEY (FROM WEIR) AND 9 AT DW SPORTS. THE STRETCHES WILL BE CLOSED FROM 5PM AND WILL RE-OPEN AT DAWN SUNDAY MORNING. TEMPORARY BAN ON KEEPNETS ON ALL EARL STILLWATERS WITH IMMEDIATE EFFECT. The KHV Virus is affecting waters not too far away from ourselves. With this is in mind we are banning the use of keepnets until further notice. We all have a responsibility to protect our fish. There are not many members that use keep nets but they are certainly a high risk piece of equipment if not fully dried out after visiting other waters. IF THE VIRUS HITS OUR WATERS THEN IT WOULD BE CATASTROPHIC! 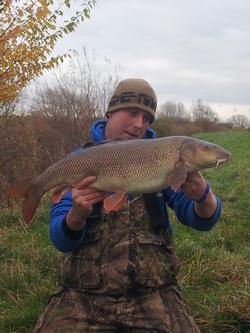 Stunning 12lbs Barbel for Ricky Cross yesterday.. The Earl is having a Barbel Match on Saturday 24th September - 30 entries max spread over 3 stretches - Borrowash, DW Sports and Darley. £20 entry - if you are interested get in touch now. Payment secures place. Woodrow's Pond - the match scheduled for this weekend has now been cancelled so the Pond will be open to season ticket holders. Match - Woodrow's Pond will be closed this Saturday from 10am to 2pm Sunday. What a fantastic day we all had on Saturday at the 2nd Earl's Fancy Dress Match at Allestree Park Lake. Once sponsor money in we will have raised over £1,500 for Autism East Midlands. Amazing! Woodrow's Pond at Derwent Valley Fishery will be closed tomorrow until 5pm for the Retired Members Match. Thanks. ALLESTREE PARK CLOSED THIS SATURDAY UNTIL 4PM FOR OUR ANNUAL FANCY DRESS CHARITY MATCH - PLEASE COME DOWN AND SUPPORT US RAISING MONEY FOR A FANTASTIC LOCAL CHARITY! Craig Hackney emailed this morning as not on facebook. "Caught this wonderful PB at 13lbs 5ozs last night on the Earl's River Derwent. Only bite I had, it pulled the rod right round then out of the bottom rod rest with the rod balancing only on the top rest with the reel screaming and the fish shooting off down the River. All very dramatic with a great fight to follow - I expected to lose this one such was the power of the fish and strength of flow on the river but managed to net it. 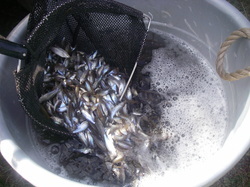 I then left the fish to rest in the net before weighing and taking photos. 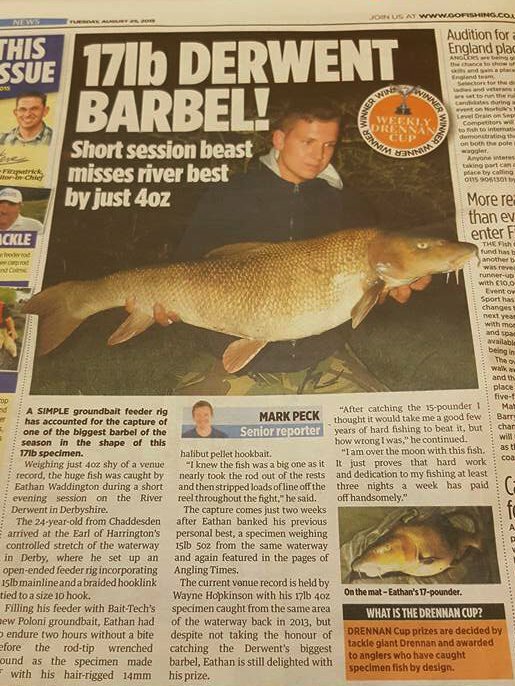 This is why I joined the Earl to beat my previous PB of 10lbs 12ozs from the river Trent last November. Great river and fantastic club and will try to beat this fish by the end of the season but could be quite a task due to the strength and smartness of these Derwent Barbel which are far harder to land than any I have had before. Thanks Earl"
ALLESTREE LAKE WILL BE CLOSED NEXT SATURDAY, 16TH JULY UNTIL 4PM. THE EARL'S FANCY DRESS CHARITY MATCH IS TAKING PLACE. PLEASE COME DOWN AND SUPPORT US. ALL DONATIONS TO AUTISM EAST MIDLANDS. NEW LAKE RECORD FOR ALLESTREE - Wesley Shaw landed Moz last night at 29lbs 4ozs. Gutted he couldn't get a decent photo but that's the way it goes sometimes... fish welfare top priority. Well done Wes and very much deserved..
Great start to the river season for Ross Winfield and Clive Frost - Fishing the Darley Stretch - Ross had 27lbs and 6lbs 3ozs over 2 sessions to include chub, chublets and dace. Clive bagged up on dace for a weight of 10lbs. Superb start to the river season for Ben Hughes - 12.30am and an 11lbs 5ozs Barbel in the net. Well done Ben! UPDATE - WOODROW'S POND WILL RE-OPEN TOMORROW, SATURDAY 11TH JUNE. Cracking 19lbs Common landed by Ricky out of Woodrow's Pond today..
ALVASTON PARK LAKE IS NOW RE-OPEN. THANK YOU. ALVASTON PARK LAKE CLOSED - We apologise for any inconvenience but the lake is closed as the Carp are spawning. Will re-open as soon as possible. Please check for updates. ​Mill Dam and Canal will be closed this Saturday, 21st May until 4pm for the Annual Facebook Match. Thanks. Thrilled that 'Moz' has been landed for the first reported time this evening at 27lbs 9ozs. Sir Maurice looks great after being stocked late last year in memory of Maurice Walker... Well done Michael Horth! .. If you have wander around Markeaton Lake you will see work in progress. Lots being done to improve the banks and pegs. 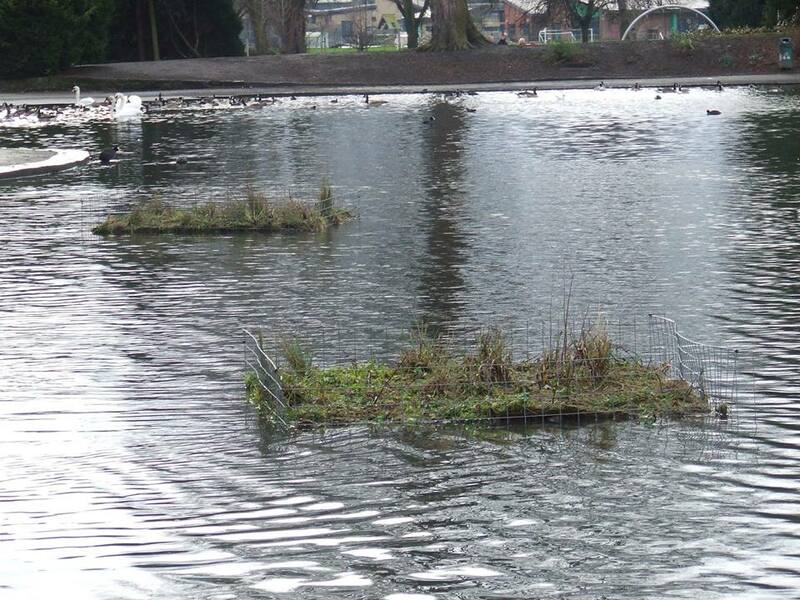 Park Volunteers have installed 19 pre-planted coir rolls which will be fully protected to stop the ducks etc grazing. They'll be a digger there soon in the same area to re-grade the bank. Additional planting can then be done by the Earl along with the creation of 3 match type pegs. This is council money and great to see the improvements after years of neglect. We have a great team at Markeaton driving these improvements for our members. Thanks to all involved.. The Earl's 103rd Annual General Meeting will take place on Thursday 21st April at 8pm. The meeting will be held at Alvaston Park Community Room (by main car park) - all members welcome (please bring your membership). Look forward to seeing you there.. If anyone knew Jason (see post below) and would like to donate a small amount to help towards his funeral and help Sue, his mum then please go along to the Just Giving Page set up. All secure and just a debit/credit card needed. 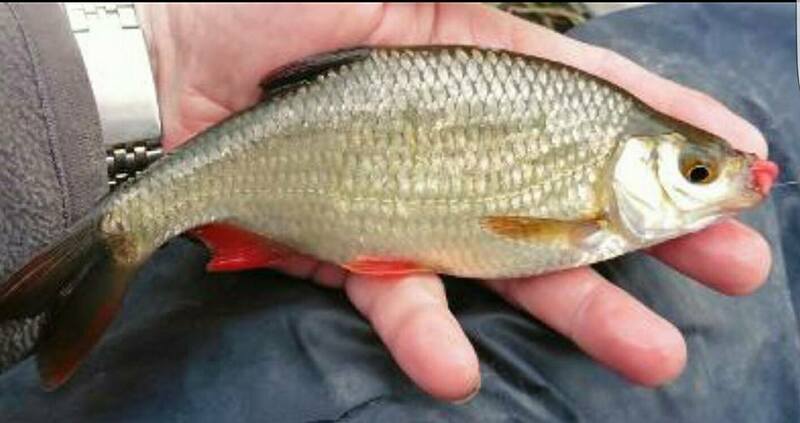 Thank You..
Just to let you know a good number of mixed silvers (mainly roach, rudd with a few skimmers) up to 10 inches have been introduced into Allestree Lake and Woodrow's Pond today. The marginal habitat and lake colour are now right for the fish to go in. A good number are spawning fish so this will help with recruitment.. The Earl was recently nominated for a Love Parks Awards. This was the first England wide award ceremony celebrating 10 years of Love Parks Week. The event was organised by Keep Britain Tidy and recognised the importance of partnership working to protect, improve and promote green spaces. Derby City Council put forward the Earl for 'Partnership of the Year Award'. Out of all the nominations throughout England, we were runners up and received a Highly Commended Award, second only to an organisation in Buckingham. 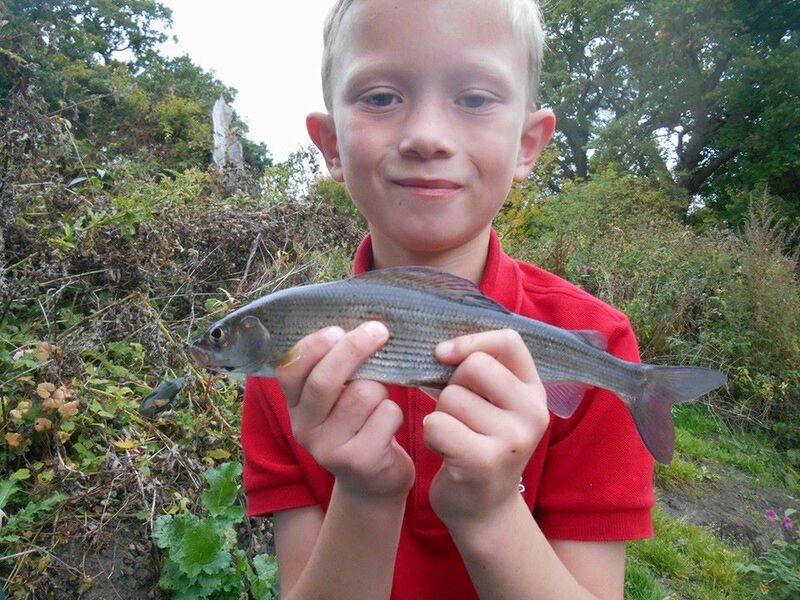 ​Just a quick reminder that booking for the Angling Trust East Midlands Junior League is still open. The league is made up of 4 matches which start on Saturday 9th April, all of which will be taking place at Rycroft Fishery on the Leicestershire/Derbyshire border. Entry to the matches costs just £1 per match and there are lots of prizes on offer from the league sponsor Preston Innovations. Young anglers need to book their place on the league which they can do by visiting http://www.anglingtrust.net/page.asp?section=1086&sectionTitle=National+Junior+Angling+League or by completing the attached application form. This is a great opportunity for any young anglers so if you could circulate the information to any interested young anglers you know it would be greatly appreciated. 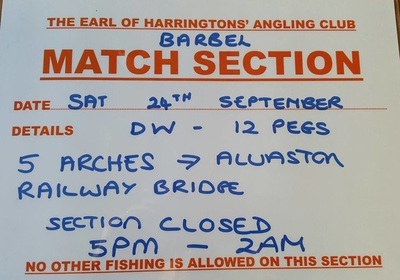 The Earl's Big Barbel Match 2016 - 30 entries split up on 3 stretches of 10 entries (Borrowash, DW Sports and Darley) - £30 entry money to cover all 3 matches = £900 (Members get first refusal). Entry money payable in advance. £75 to Club £75 to charity so £750 left . £400 to overall winner, £200 to second, £100 to third, £50 biggest fish. £2 pools on each match stretch and £20 to winner of each match stretch. To be held on a Saturday in August, September, October from 6pm - 1am. Every angler will fish each stretch. Please use the 'Contact' page or email earlofharringtonsac@gmail.com if interested. Stunning 15lbs 4ozs Barbel for Chris Martin. REMINDER - This Saturday sees the Earl's Integration Predator Match. Being held on the river from Pride Park Road Bridge downstream to Borrowash Road Bridge. It is a roving match with up to 60 anglers competing. The stretches will not be closed but will be busier. 2016/2017 Season Tickets now available online. Prices remain fixed for third year running! Will be in tackle shops at the beginning of March. 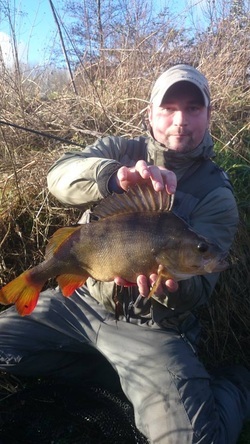 Stunning 3lbs 14ozs lure caught Perch for Maciej today.. The 5th Annual Facebook Match will take place this year on Saturday, 21st May on Mill Dam and section of Canal (20 pegs) - £10 entry of which 50% will be paid out, 25% to Charity (East Midlands Autism) and 25% Club Funds. It will be followed by a barbecue on the grass area. There will be parking available on the day. Please get in touch if you would definitely like to fish. Will be a good day. If popular then priority to Season Ticket Holders. Highlight of the season and a great day out. Get in touch via email (earlofharringtonsac@gmail.com) for full details. There is a work party this Saturday at Allestree Lake - tree removal/peg improvements so please expect some disturbance if you are fishing. 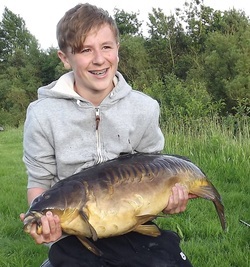 Do we have any Young Anglers (aged 16 and under) who would be interested in a Junior Angling League arranged in conjunction with Angling Trust and Preston Innovations? 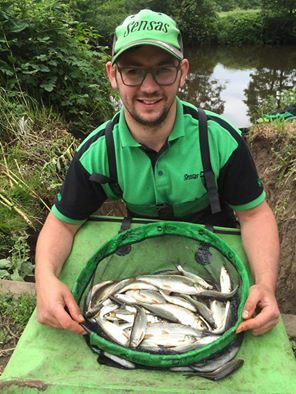 The Junior Angling League is part of a national programme offering new opportunities for young anglers to fish in competitions. 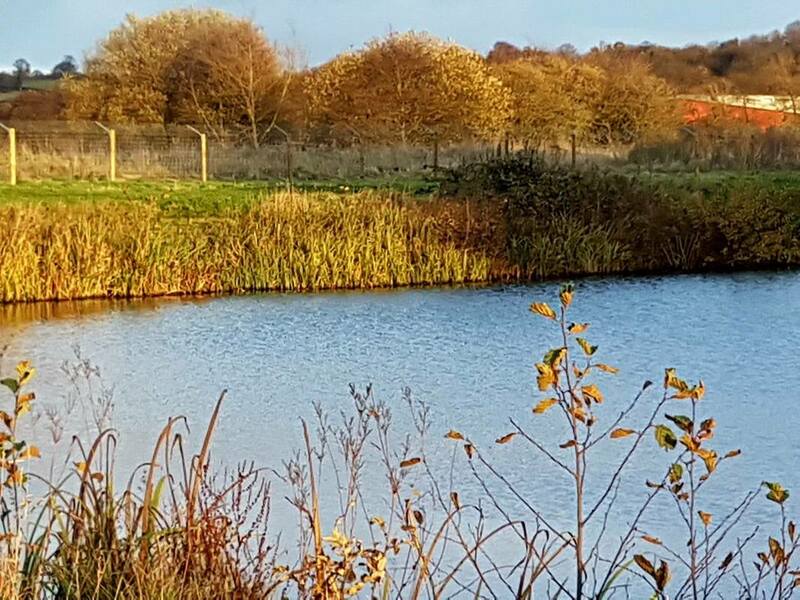 The East Midlands League will be taking place at Rycroft Fishery in Hemmington on the Leicestershire & Derbyshire border and will be made up of 4 matches which start on the 9th April. Each match costs £1 and with a goody bag for every angler & prizes from Preston Innovation it offers excellent value for money. Get in touch if you are interested or know someone that would enjoy this - all good fun! Alvaston Lake - Working hard to improve the lake and guys are giving up their free time to do this, so massive thanks for this. Today saw 2 anti-predation cages go in which will help provide refuge for our juvenile fish. 2 more to go in shortly. The cages have coir rolls on the top which are pre-planted with native wetland plants which will quickly begin to mature in the spring. Fantastic job guys.. Fantastic days work at Alvaston Lake today - nearly 70 odd hours of work done by 12 (payback team) plus committee and bailiffs. 30 barrows of leaf matter removed, 80% of the Norfolk reed raked out on the big patch. The water depth on the front edge has gone from 4 inches to 18 inches so great spawning and cover habitat. Booked the Payback team back next week so the plan is finish raking the big patch and rake the next patch along after we have cut it Sunday. Thanks to all concerned. The Earl's W Warner Open match will be held on Sunday 3rd January. Draw will be 8.00am in the Alvaston & Boulton cricket club car park. Entry Fee £13.00 inc pools. Section will depend on river levels, but trying for pegs in that area. If you would like to fish please contact Kev Hales 07779 674997 as soon as possible please. Happy New Year! The re-arranged third round of The Earl's Winter League will be held on Sunday 13th December. The match is planned to be held on the Cutting section of the river at Borrowash. Draw will be 8.00am in the car park. Fees will be £13.00 – inc peg fee, golden peg and pools. If you would like to fish please contact Kev Hales 07779 974997 before 7:00pm on Friday 11 December. The Earl is pleased to announce that there will be no increase in next year's Premium, Season, Concessionary, Junior Tickets and also Day Tickets - Prices remain the same! New Allestree Park Lake Record for Premium Member Jeff Stevens. The Long Common was landed on the 7th November weighing in at 28lbs 10ozs - A PB as well for Jeff..
Woodrow's Pond - The pond will be closed for fishing next Wednesday, 11th November for fishery maintenance - apologies for any inconvenience caused. The third round of The Earl's Winter League will be held on Sunday 15th November. If you would like to fish please contact Kev Hales 07779 974997 before 7:00pm on Friday 13th November. Carp Match on Alvaston Park Lake 6th - 8th November. The lake will be closed from 11am Friday until 4pm Sunday. MATCH REPORT : Round 2 of The Earl of Harrington's AC Winter League. Sunday 25 October. The match was held on the Darley Fields stretch. With the temperature dropping to 2 degrees over night and a distinct nip in the air, a few souls thought better of it! The draw saw 11 people put their hands in the drawbag. The golden pegs were 9 & 17, if the winner came from either of those pegs, they would have taken and extra £75; but not today, so this rolls over to the next match. The match was fished 9:30-2:30. With the river in desperate need of some water with a very slow pace, most people set up waggler & stick and few poles jutted out from the bank. Most fished maggot, caster or worm. Every angler caught, the higher number pegs getting mainly Dace, with occasional Roach, lower number pegs saw some very nice Roach. Top weight went to Tim Baker from peg 7; 13lb 3oz, mainly Roach, caught on stick, maggot & caster, 2nd was Clive Frost with 9lb 12oz, from peg 13: mainly Dace, waggler and maggots, 3rd and section win for Mark Harrison from peg 5 with 8lb 9oz, mixed Roach and Dace on wag'n'mag with a hint of pole. 4th and asection win for Vaughan from peg 11 with 7lb 8oz. Next round is on 15 November, probably on the Cutting. Further information will be posted the week before. UPDATE MILL DAM PARKING. ...as of 1st November members will NOT be able to use the car park for 12 months due to contractors being on site for University building works. Our locks will be removed. Assurance has been given by the University Estates Manager that the car parking will be re-instated once the work is complete. Apologies for any inconvenience caused but totally out of our control. END OF SEASON PREDATOR LURE/DEAD BAIT MATCH - SATURDAY 5TH MARCH 2016 - The Earl is ending the river season with another Predator Match. Aiming to have 100 entries for the biggest and best social occasion on the bank of the season. Final chance to raise money for our Charity of the Season - Derby Kid's Camp. If you are interested then get your name down by emailing the Earl at earlofharringtonsac@gmail.com - REALLY NOT TO BE MISSED! 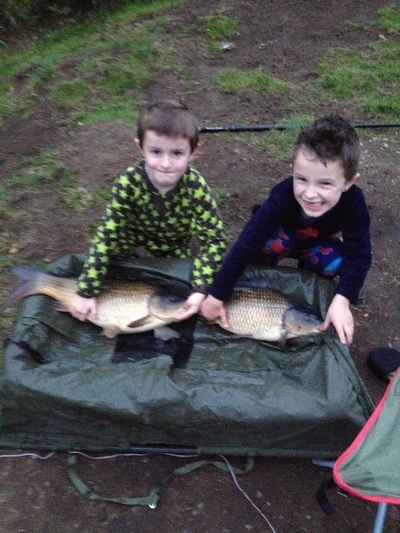 The Young Anglers were leading the way this weekend - Cousins Jack and Kae Moore enjoyed a session on Woodrow's Pond with their Dads and both landed 2 pristine Common Carp. 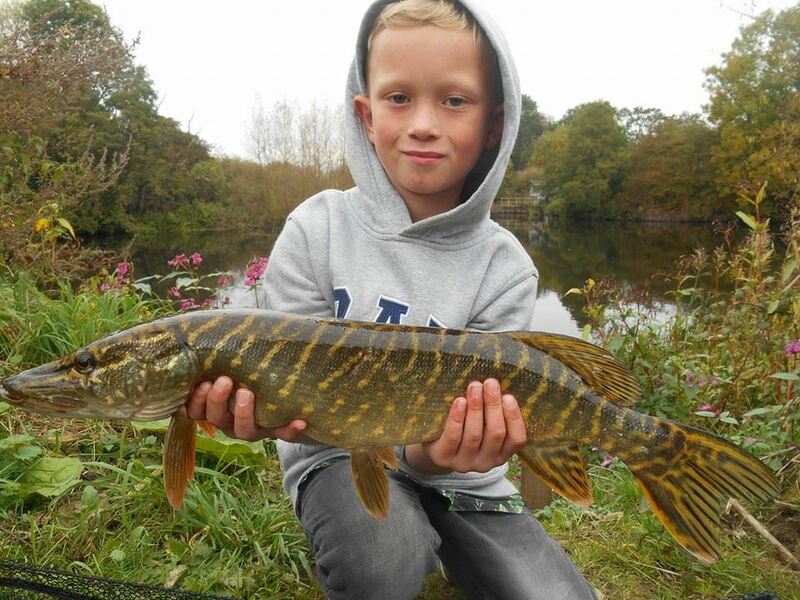 Sunday saw Archie Webster catch 2 new species, a Grayling and a Pike. Well done to all of you! PLEASE READ - The Annual Midland Canoe Club Slalom Event at Darley Abbey Weir takes place today, tomorrow and Sunday. There will be alot of activity from the area of the toll bridge down to the bottom end of Dean's Field (by Abbey Pub). It may be better to avoid the area this weekend. Thanks. CLOSURE - Derwent Valley Fishery (Woodrows and Haslams) will be closed from Thursday 17th September to the Monday 21st September for lake development and improvements. Re-opening will be Tuesday 22nd September. STRETCH CLOSURE FOR CHARITY BARBEL MATCH - Saturday 26th September. 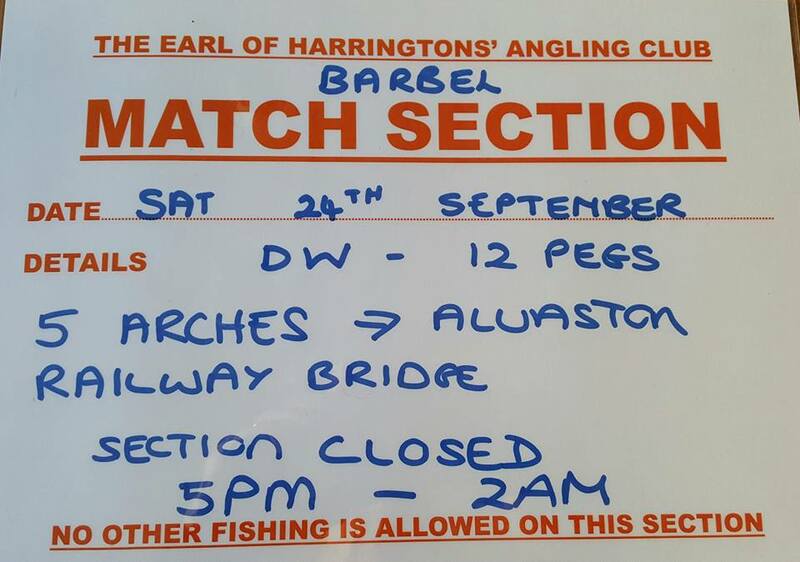 The Earl is having a 15 peg Barbel Match with proceeds going to The Army Benevolent Fund. The stretch will be closed from Black Weir downstream to Borrowash Road Bridge from 2pm Saturday afternoon, 26/9 until 2am Sunday morning. Fishing Photography Workshop - Tuesday, 13th October at 7.30 in Derby - Want to improve your photo skills? Have the gear but no idea? The Earl is holding a Social Evening Workshop - If interested please email earlofharringtonsac@gmail.com for full details. Entry is free to Earl Members. £2.50 Non-Earl Members paid to charity Derby Kids Camp. 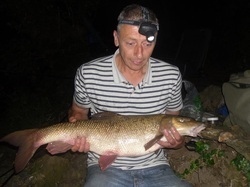 A new PB for Chris Martin - magnificent Barbel landed at 16lbs 8ozs. 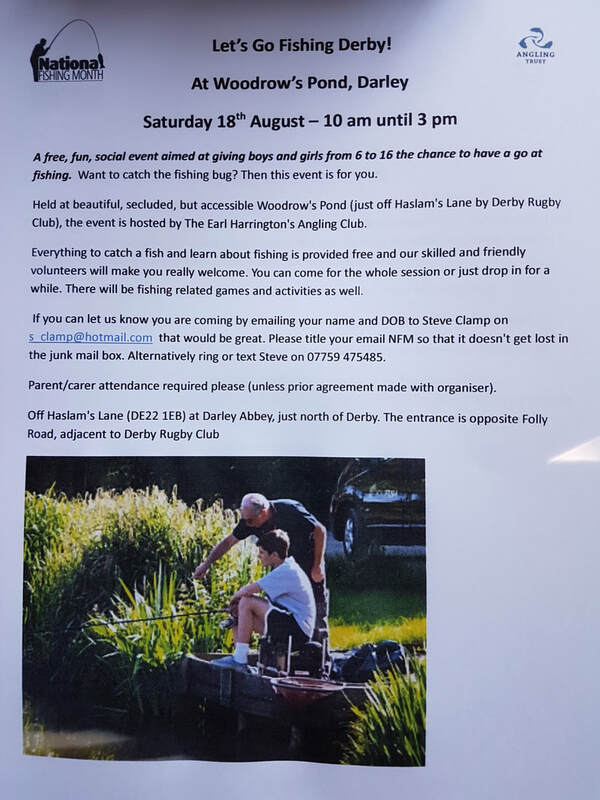 Match Dates and Details over the next few days - please read..
MONDAY, 17TH AUGUST - We welcome the return of the Northern Monkeys and the ABF Charity Barbel Challenge. Stretch closed from farm bridge by car park at Borrowash downstream to road bridge from 8am Monday until 12 noon following day. WEDNESDAY, 19TH AUGUST - Travis AC - evening match - starting at Darley Weir (8 pegs) - Park Side. SECTION CLOSURE - We welcome the return of the Northern Monkeys and the ABF Charity Barbel Challenge next Monday, 17th August. Woodrow's Pond at Derwent Valley Fishery will be closed from 5pm this Wednesday, 22nd July. Re-opens at dawn on Thursday, 23rd July. This Saturday sees our 4th Annual Charity Facebook Match (See Poster) - You do not have to be on Facebook to take part and it is an Open Match. Markeaton Park Lake is closed to fishing from Saturday night through to late Sunday due to the Jensen Button Triathlon taking place. It's taken 20 years for Darren Hunt to break his UK PB Carp Record at 24lbs. 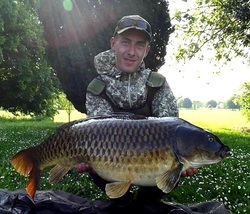 He has now achieved this and landed this beautiful common at Alvaston Park Lake at 26lbs on the fly! 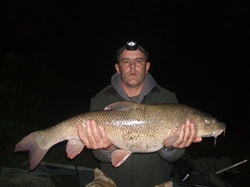 Stunning PB Barbel for Matt Webster last night. 3 hour session produced 3 Barbel and the biggest going 14lbs 3ozs which is a fantastic early season size. River season just started and Ricky Cross and Kam Sulima have both landed PB Pike. Monsters! An amazing day was had by all at the Earl's Fancy Dress Charity Match held last Sunday at Allestree Park Lake. The Charity for this season is Derby Kids Camp who provide camp holidays to Derby children, who otherwise may never get a holiday - By having the match, we have raised £1000 through donations and sponsorship which means 10 kids can now go to camp. It isn't all about the fishing but about caring and we certainly do that! 2 weeks this Saturday sees our 4th Annual Charity Facebook Match (See Poster) - You do not have to be on Facebook to take part and it is an Open Match. ALLESTREE PARK LAKE IS CLOSED THIS SUNDAY, 28TH JUNE TO ANGLERS UP UNTIL 4PM. THIS IS DUE TO OUR FANCY DRESS CHARITY MATCH TAKING PLACE. THANKS! Due to adverse weather conditions for Saturday, 13th June the Fancy Dress Charity Match at Allestree Park Lake has now been rescheduled to Sunday, 28th June to coincide with Allestree Park Fun Day. 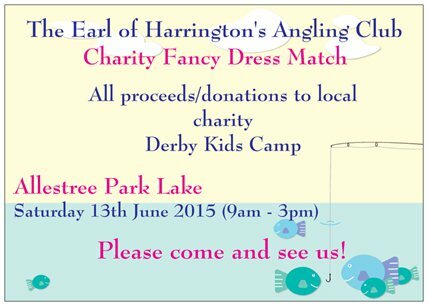 Just a reminder that Allestree Park Lake is closed for fishing this Saturday (13th June) for our Fancy Dress Charity Match. The lake will re-open at 4pm. Please come down and see us! 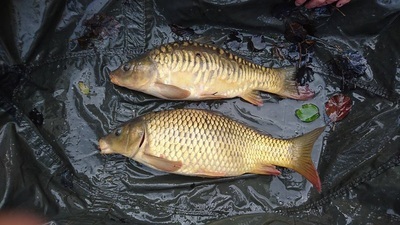 The carp are spawning in Haslams and Woodrow's Pond and as part of fish welfare, both remain closed. We will get them both re-opened as soon as possible. Tench of a lifetime for Jason Palmer this weekend - Haslams specimens are growing well and this was proven at the weekend with a pristine 10lbs 3ozs Tinca. Well done Jason! The Earl's 102nd Annual General Meeting will take place this Thursday at 8pm at Derby University, Kedleston Road. Plenty of parking available. All Earl members welcome (please bring your ticket) - This is your chance to have your say! The Earl would like to announce the new stocking to Mill Dam Canal. The canal is in need of a lot of work but it is fishable on the first peg and also beyond the second gate to the very end. 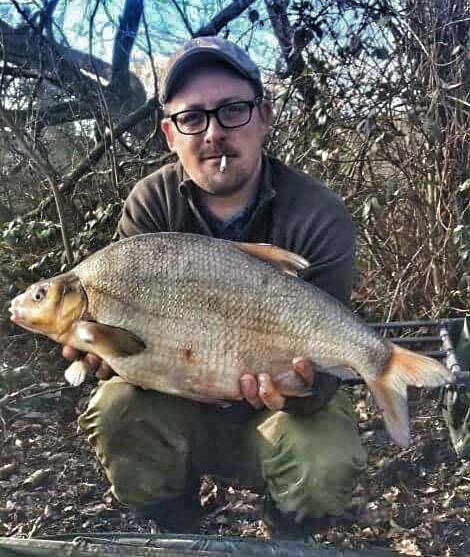 There are some real gems to be caught such as Crucians to 2lbs, Rudd and Roach to 1lbs, Skimmers and Bream to 4lbs plus Perch, Hybrids, Pike and the odd Carp. 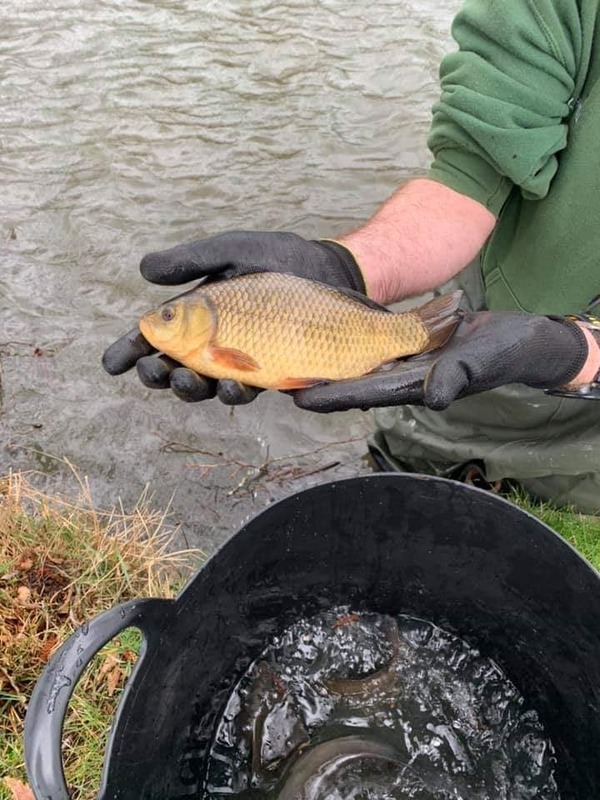 We have stocked quality stamp Rudd and specimen Crucians earlier this year and plan to continue work to the canal including pegs, path and water maintenance. Fishing the float or pole seems to be the better methods as the bottom is very silty due to years of neglect. We are holding work parties to continue with the improvements. Hope you enjoy! 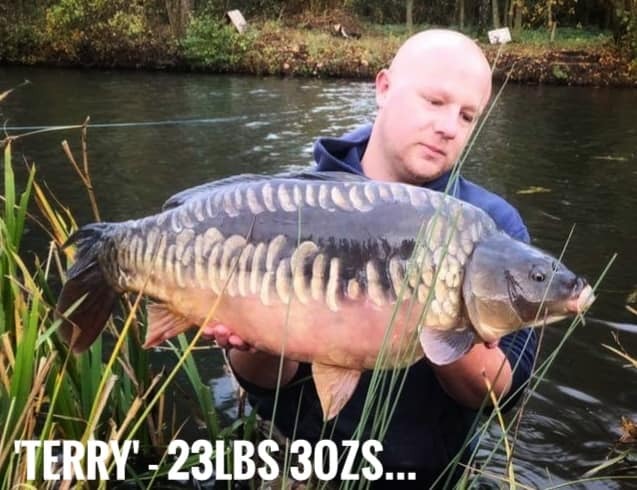 Woodrow's Pond - Introduction of some further stunning scaley mirrors and commons averaging 3.5lbs..
Ricky Cross landed the Earl's first 30lbs Carp. 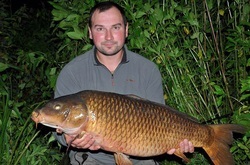 Amazing achievement by Ricky - Common Carp weighing 31lbs. Steve Kelly was back on the Earl last night. 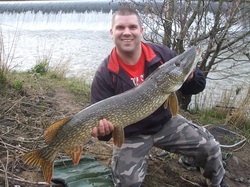 To add to his monster pike at the weekend, Steve only went and landed a PB Barbel at 15lbs 2ozs!! 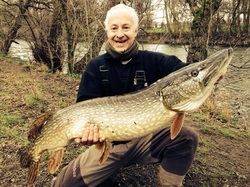 Monster of a pike landed by Steve Kelly - 22lbs - well done Steve! What a day! Mark Harrison won the last The Earl of Harrington's Angling Club winter league match today. These two beauties 13lbs 8ozs PB and 12lbs 8ozs did the business and Mark lost one first cast. Both fish landed on a 4lbs bottom to a 16 widegap specialist hook too!!! both phenomenal fights...... and they were not put in a keep net! Mark landed, weighed and verified and they were returned safely. 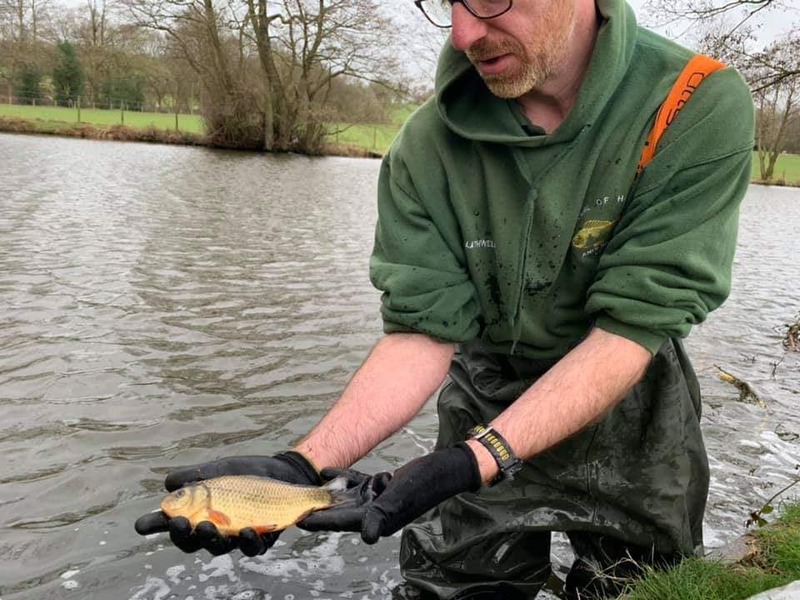 Top Fish Welfare - thanks to Tim Baker for helping Mark out, leaving his own peg to verify and take these fantastic photos. Roger Cramer returned to the Earl yesterday following his success of landing his magnificent 4lbs 10ozs Perch. Roger fished a new stretch looking for more perch. One decent bite on lob worm produced this 5lbs 14ozs Chub. Not a PB this time but still a good chub on light ledger tackle meant for Perch. Fish of a lifetime for member Roger Cramer off the Earl. A PB Perch at 4lbs 10ozs!! The beauty took a basic ledgered lobworm in a swim baited with chopped worm, caster and red maggot. The only bite of the day but what a bite! 2015-16 Season Tickets are now available to buy online (Please go to 'Purchase Tickets Online' Section - Will also be in tackle shops at the beginning of March. Natures Baits Fishermania ltd Predator-Maniac Cotswold Angling David Miller Art Etang De Brigueuil Carl and Caroline and Lola's Nana for Monkey Hats! The Earl Carp Cup, Annual Facebook Match, Predator Lure Match, Barbel Match and not forgetting £2 donation day with Jerry and Army Benevolent Fund. I aim to do it all again for the coming season and have chosen Derby Kids Camp - www.derbykidscamp.co.uk, a local charity giving disadvantaged children much needed holidays/breaks along with respite care for parents/carers. It is run 100% voluntarily and am looking forward to raising some cash for them. The Earl is letting you know details of an incident that happened yesterday on the river. 2 members were fishing the Cricket Club Stretch when 2 youths on the opposite bank (Alvaston Park end), decided to pelt rocks at them. The members did not engage with them and moved themselves and their gear as far away from the river whilst packing up. The youths were very threatening. The Police were informed immediately on 999 and they arrived quickly. The youths were found and arrested and it has been logged as an assault. They were known to the police and have been causing trouble over the past week. This is the first time an incident like this has been reported and hopefully is an isolated incident. Please be reassured that the Bailiffs will be patrolling and will be extra vigilent. The Landowner at Derby Commercial Park near the Blue Jay is no longer allowing members to drive down the service road nor to use the anglers car park for river access to Deeps/Parlour etc. The car park was provided as a good will gesture a few years ago. We are obviously extremely disappointed and upset. The Company are stating that the estate roads are private roads and any vehicular access is restricted to the occupiers of the buildings. Any cars parked on the roads and the car park will be towed away. Signs will be going up warning that parking is not allowed. We are seeking legal advice and will keep you updated. Thanks. Happy New Year to all members. We are now in the process of writing the Season Tickets etc for the new season commencing March 15th. We can confirm that all of our prices will remain the same for the coming season. Any new season ticket member will be required to purchase a gate key at a cost of £5. ﻿A lot of Derby anglers have fond memories of fishing their "local water" and, regrettably, most have fallen into decline over the years. The Earl of Harrington's AC, working with Derby City Council, have started a program to improve and restore these fisheries back to their former glory. All club "profits" will be invested back into the fisheries and we need anglers to buy in to this restorative plan. We have been delighted with the response to date...Thank you! 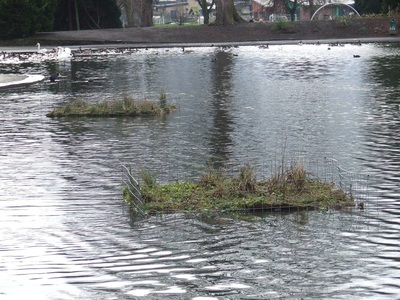 WOODROW'S POND CLOSURE - The pond will be closed all day next Wednesday, 19th November for bank improvements. What a fantastic day we had! Not just a fishing match but a great social day out - 43 of our Polish Friends arrived from all over the country along with 5 English to take part in the event. The weather was perfect - mainly overcast with the river being slightly coloured. We all met, registered and socialised. Lucasz and Jarek brought their stalls along with lure related items for sale. The match was fished for 5 hours and to finish the day we had a Polish Sausage Barbie, which went down very well! More socialising and a few shots of Asia's Pear Liquor later, saw the presentation of prizes. In first place was Pawel Szyluk with a combined total length of 217cm. This was made up of 2 pike and 3 perch. Pawel won £120, a beautiful perch glass tankard, hand engraved by Maciej, a chest-pack donated by UK-Lures, Lures donated by Predator-Maniac and a hand made lure from Piotr. 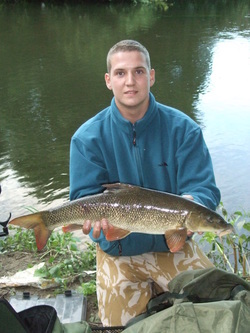 In 2nd Place was Pawel Dabrowski with a combined length of 182cm made up of 2 pike. Pawel won £70 in cash, a perch-engraved glass tankard and lures. 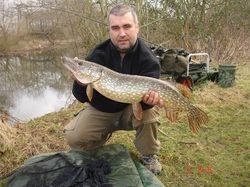 Pawel also won the biggest fish prize with a PB Pike of 111cm (20lbs)! 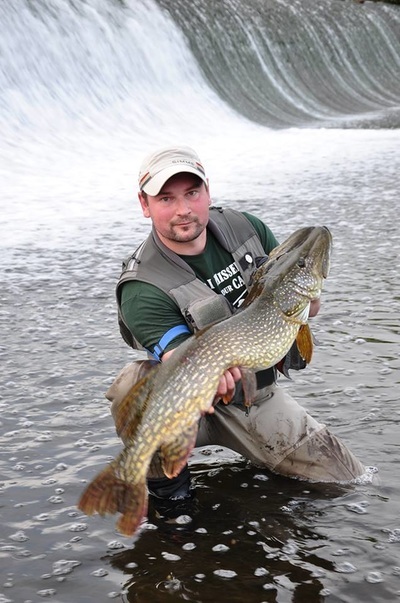 3rd place wnet to Piotr Palka with a combined length of 131cm made up of 2 pike. Piotr won £45 in cash, a perch-engraved glass and lures also . A total of 22 Pike were landed and 7 Perch. 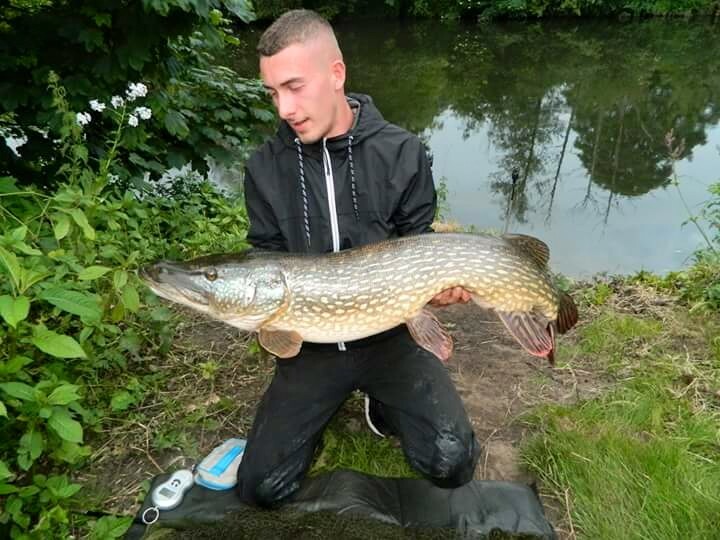 3 Personal Bests were achieved on the day - Pawel's Pike at 20lbs, John Mansell with a 3lbs 5ozs Perch and also young Kacper with a 91cm Pike - fantastic! 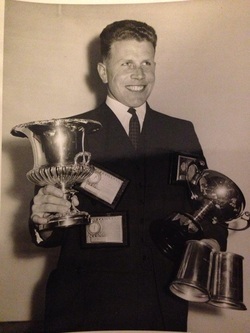 Joseph Danby also beat his Dad, British Pike Squad Member Paul Danby. Joe landed a Pike and a Perch for a combined length of 103.5cm. Well done Joe! We also raised £117.50 which will go towards Club Funds and also £117.50 to www.fishingforheroes.com. This now takes the total donations to the Charity of over £2000 for the Season so truly amazing! Thanks to everyone who helped on the day to make this a truly special competition. 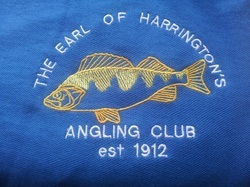 So proud of The Earl of Harrington's Angling Club.. THE EARL'S PREDATOR LURE MATCH takes place this Saturday between Alvaston Railway Bridge downstream to Borrowash Road Bridge. The stretch will be busy with anglers between 11.3am - 4.30pm. The river sections will not be closed but might be worth bearing in mind if you are thinking of having a session. ALLESTREE LAKE CLOSURE THIS SUNDAY 12TH OCTOBER UNTIL 4PM. This Sunday sees the first round of the Allestree Lake Champs. There are 2 places left for this Sunday, so anyone interested please get in touch, £20 entry money and match rules apply. All anglers must have a valid Premium Ticket or Stamped 2014/15 Season Ticket. 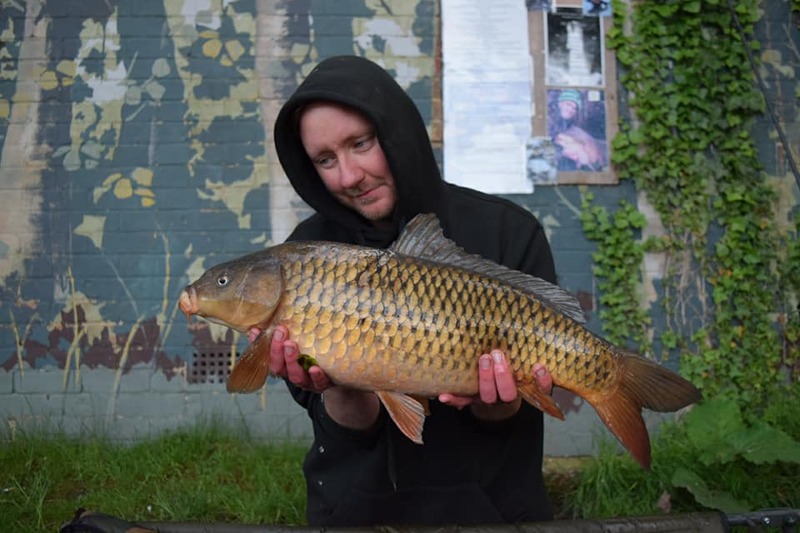 Maximum number of anglers at any one time - 15 on Haslams, 3 on Woodrow's, 6 on Allestree (park side bank), 10 on Markeaton, 3 on Mill Dam, 10 on Alvaston and 5 on Heatherton. 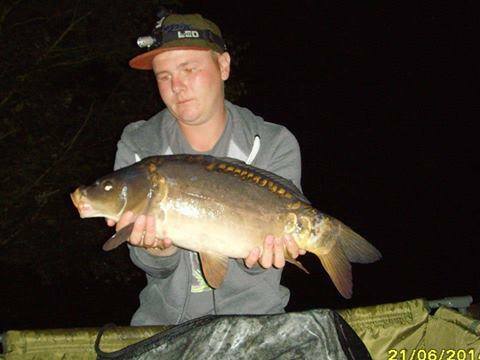 Maximum of 3 rods on Haslams, Markeaton, Allestree, Alvaston, Heatherton. (Please ensure you have 2 rod licences). Maximum of 2 rods on Woodrow's and Mill Dam. Maximum of 48 hours on Woodrow's and Mill Dam. 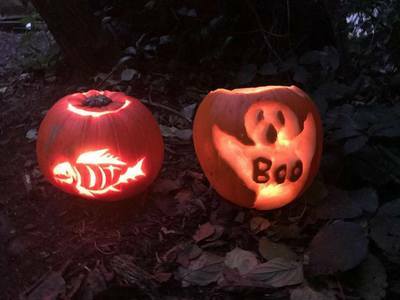 For night fishing – Anglers must book on prior to night fishing 24-48 hours advance by phoning or texting on the dedicated mobile number 07936 150412 or preferably Teresa Parr 07891 547968 (Please note you cannot book a specific peg) – Please indicate how long your fishing session is likely to be. A Premium member is eligible for one accompanying fishing guest at a cost of £10 per 24 hours. Payment must be made prior to session, either via PayPal/online banking or cash by arrangement. Other Premium Ticket Holders will always have priority over guests – e.g. If 4 booked on Heatherton, then only 1 fishing guest allowed – Max number of anglers will not be exceeded. You will receive a gate key free of charge with your ticket. If lost, a replacement key will be £5 available only from Club Secretary. Gates to fisheries must be locked at all times. Always ensure your nets are bone dry before commencing session, this helps any bacteria to die off. All human waste MUST be bagged up and taken home when leaving the fisheries. We do allow dogs onto our fisheries, however the must be kept on a lead at all times, you must clean up after them and they must not be noisy. 10lb minimum breaking strain line. Work has today begun on improving the track at Derwent Valley Fishery. The Fishery remains open but please take extra care and delays may be likely getting to Woodrow's Pond. Thank You. IMPORTANT ANNOUNCEMENT AND GREAT NEWS! With immediate effect we have secured parking for season ticket holders at Mill Dam. Huge thanks goes to Derby University for this who have been truly outstanding in doing the work for us. There is basically secure parking right by the dam. Access is via Markeaton Street to our lock on secure gates. Drive through to hard standing (Old Sturgess School Playground). During the next few days another lock will be put on a single gate from the car park which will bring you directly on the the dam bank. In the meantime just use the main gates. Result!! 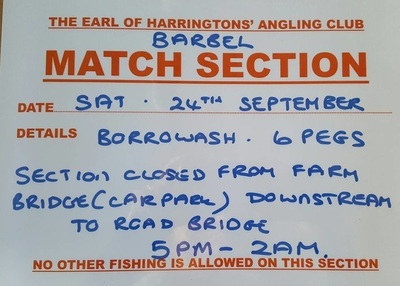 NOTICE - BORROWASH STRETCH CLOSED 6/9/14 FROM 4PM - 1AM SUNDAY MORNING FOR A CHARITY BARBEL MATCH - SHUT FROM BLACK WEIR DOWNSTREAM TO BORROWASH BRIDGE. APOLOGIES FOR ANY INCONVENIENCE CAUSED. NOTICE - Woodrow's Pond will be closed for a Charity Match from 8am this Saturday 6th September until 10am Sunday 7th September. We apologise for any inconvenience caused. We are delighted that the Earl raised over £1,000 in our Earl Carp Cup which took place last month. An amazing amount for our chosen charity http://www.fishingforheroes.com - thanks to everyone who donated! PLEASE NOTE THAT ALLESTREE PARK LAKE WITH BE CLOSED THIS FRIDAY, 25TH JULY FOR MAINTENANCE WORK - WE APOLOGISE FOR ANY INCONVENIENCE CAUSED. 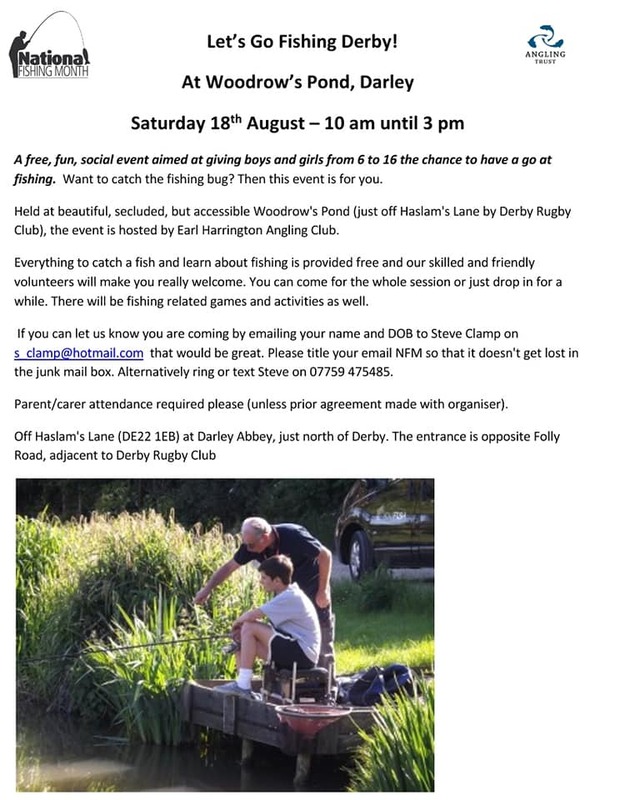 If anyone is interested - Tony Lomas of Holmenook Farm, Darley Abbey is hosting a Charity Fishing Match to raise funds for the Radiotherapy Department at the Royal Derby Hospital. The match is to be fished on the Derwent further upstream to the Earl Stretch. The match takes place this Sunday from 10am - 3pm with breakfast being served at the farm from 7.30am - 9am (£5). Match entry fee is £20 and and there is prize money to 1st, 2nd and 3rd. The day will finish with a disco, real ale and a good time generally at the farm. If anyone is interested then please contact Tony direct on 07934 967419. 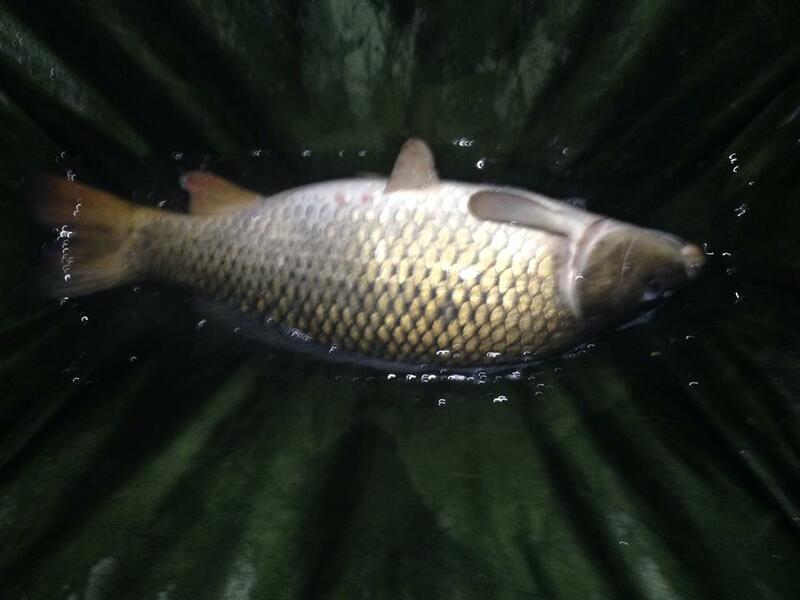 We are delighted to announce that a good number of carp have today been stocked into Alvaston Lake. This is the start of an ongoing fishery improvement plan that will be comprised of three main areas - improving the fishery habitat by way of increased areas of marginal and aquatic plants (essential to improve water quality, improve spawning and to provide more refuge for juveniles), improve the fishing areas (possible platforms) and increasing fish stock levels. In time, by getting the balance right the lake will become "self-sustaining" and can be a great fishery once again. 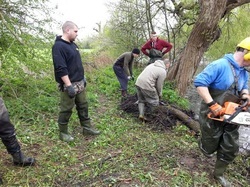 The Earl of Harrington's Angling Club are working closely in partnership with Derby City Council with the sole purpose to improve the Derby City Council lakes and the River Derwent for the benefit of our members, mainly local anglers. 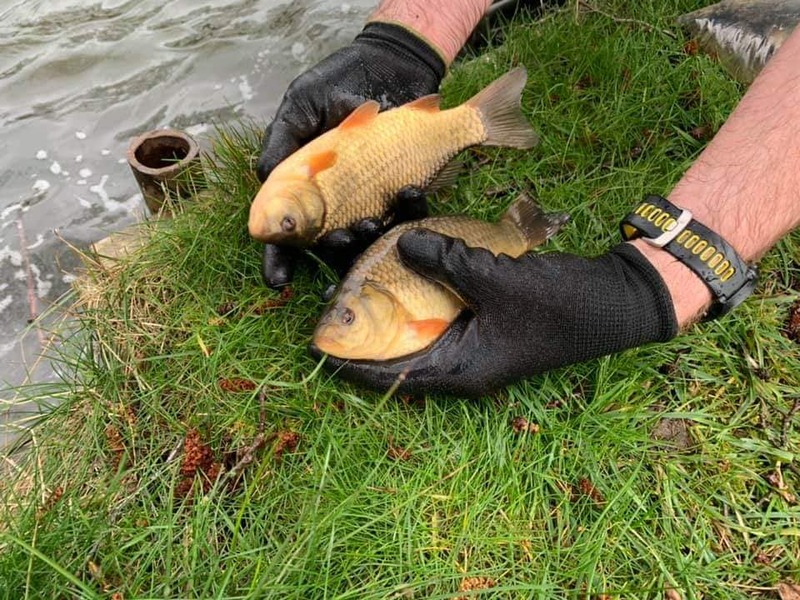 We are delighted to announce that this investment of fish has been funded by Derby City Council and this clearly demonstrates their commitment to improving the Derby City lakes, as well as the strong working relationship that we now have with Derby City Council. 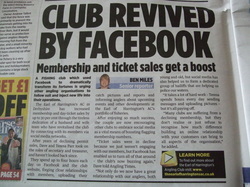 This is great news for our members and the future is indeed looking very bright. 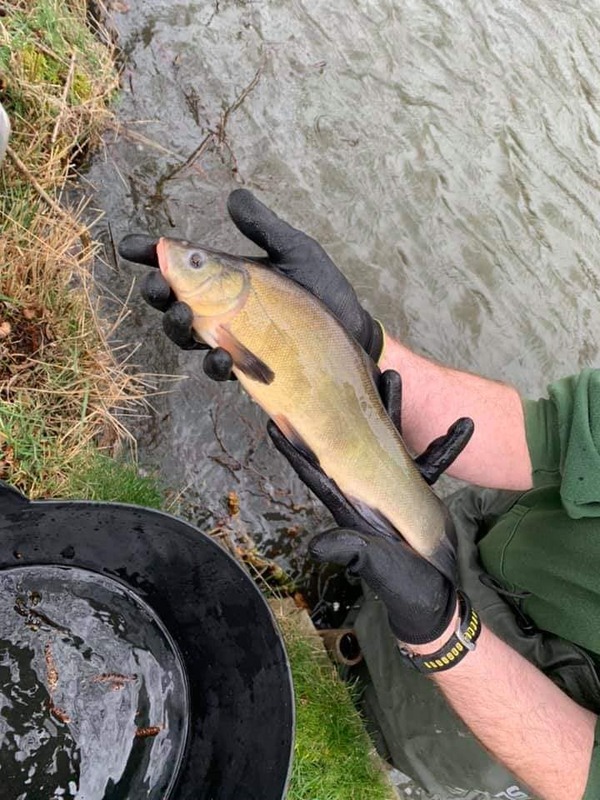 Derby City Council and The Earl of Harrington's Angling Club, working in partnership, are committed to investing in and improving all of the Derby City fisheries and we will continue to work tirelessly to deliver this. Exciting times ahead! Thanks as always to Andrew at AE Fisheries! New Fundraising Page Launched - Go and check it out! DERWENT VALLEY FISHERY - Major improvements are to start on the track tomorrow morning (main gate through to Woodrow's Pond) - there has been a delay due to the digger breaking down - all should be completed by the end of the week. Will keep you updated. 1st Earl Cup is here! Mick, Adi, Andy, Dean, Ian, Ricky, Dan, Shaun, Peter First weekend at Allestree and Haslams - Dean is in the lead with 3 carp totalling 38lbs 7ozs, Pete in 2nd with 2 carp totalling 30lbs. Ian is in 3rd with a superb carp at 20lbs 8ozs. Shaun 11lbs 2ozs, Andy 11lbs 1ozs and Mick at 11lbs. Ricky, Dan and Adi still to get off the mark. All to play for in 2 weeks time - bring it on!!! What a start to the river season! Kamil Sulima landed this 25lbs 2ozs River Carp shortly after midnight which is a new PB for Kam - amazing! All photos will be regularly added to the photo gallery so go and take a look! The Earl would like to wish members old and new a fantastic river season... Tight Lines to all! The Earl is aiming to raise £1000 for www.fishingforheroes.com who support war veterans who are suffering from Post Traumatic Stress Disorder, combat fatigue or any other emotional or psychological problem relating to them having been involved in active service. On average, because some need more support than others, it costs in the region of £1000 per annum per veteran. This includes an initial 4 day residential course, the same again as a follow up course and attending at least 2 get togethers. Most of the lads they support have nothing, so the cost of everything ie travel, accommodation, instruction, catering, giving them equipment to take away with them (rod, reel and line etc) ongoing support, mentoring and of course the fish tickets is covered. Since the beginning of the year (April for us) we have received 14 applications.... so it's going to be a busy year !!!" We kick off the year with the Earl Carp Cup beginning 20th June and the guys entering are all busy getting sponsorship. We will then carry on with the Barbel Match and Facebook Match and so it will continue. ALVASTON PARK LAKE - magical day for 19 years old Club Bailiff Ricky Cross today - he had a double run and landed a 17lbs + Mirrror Carp and also this stunning 28lbs 7ozs Common which is a PB for Ricky. If any Season Ticket Holder is interested in upgrading to a night permit for Alvaston Lake only, you now can do for an additional sum of £20 for the season. Please contact the Earl if interested. 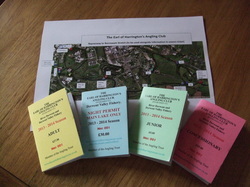 A Reminder that Night Fishing on any of the Council Still Waters and Woodrow's Pond at Derwent Valley Fishery, is only available to PREMIUM Ticket Holders only and any Season Ticket Holder that has purchased an 'off peak' night pass (Monday - Thursday) for the Council Still Waters or a Markeaton Only Night Pass or an Alvaston Only Night Pass. 1. Any member with a 14/15 Season Ticket now has the option to purchase a Markeaton Lake ONLY night permit for a further payment of £20 = £60 in total for adult. 2. Any member with a 14/15 Season Ticket has the option to purchase an Alvaston Lake ONLY night permit for a further payment of £20 = £60 in total for adult. Rules exactly the same as for Premium Ticket. Any Premium Ticket Holder has the option to downgrade but if they change their mind they will go back on the waiting list. Monday - Thursday (arrive after 12 noon Monday, off by 12 noon Friday). Season Ticket + £30 = £70. MAXIMUM OF 15 TICKETS AVAILABLE FOR THIS OPTION. There will not be new tickets printed. Your existing/new Season Ticket will be stamped showing details and signed by 2 committee members. Payment is to be made direct to the Earl (not outlets). If any member is interested then please message the Earl. Mental Health Week endorses the work of Fishing For Heroes - We are organising our first Carp Earl Cup to take place over 2 weekends. 10/12 guys will be fishing 4 x 24 hour sessions to raise money for this great charity. 100% of donations will go to Fishing For Heroes. Please sponsor us, no matter how small and spread the word. Thank you! HEATHERTON POND, LITTLEOVER - I have been contacted by the owner of Hall Pastures Farm who's drive runs parallel to Heatherton Pond on the far side. Anglers are parking at their entrance and also half way up and going over the fence. Can you please not do this as it is a working farm and access is required at all times. Appreciate there is no official parking area up there yet (we are working on it) but please take note and don't park on the farmers drive. 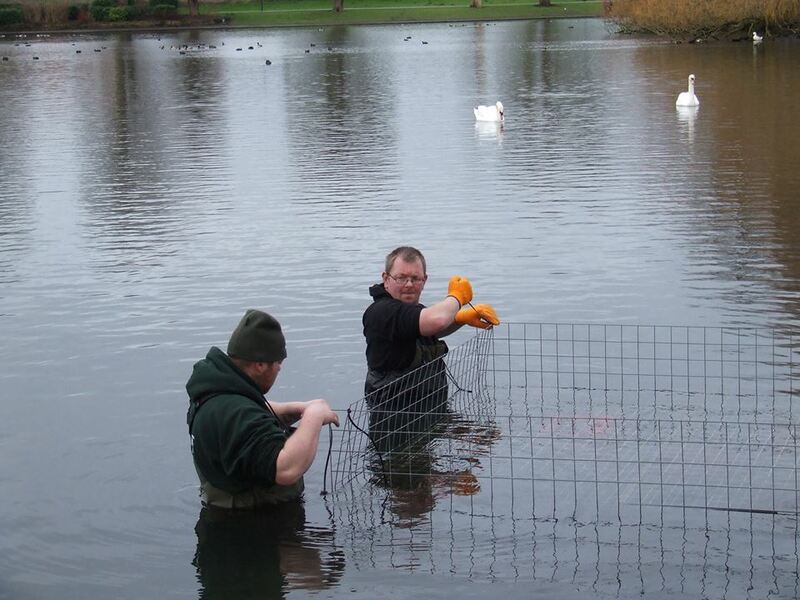 Our Third Markeaton Park Lake Work Party is to be held on Saturday 24th May from 9am - meet in main car park. Any help gratefully received!! Second Markeaton Park Lake Work Party to be held on Saturday 3rd May from 9am - meet in main car park. If you would like to join us in making a difference then you are most welcome! All Premium Tickets for night fishing the new stillwaters and exclusivity on Haslams have now been allocated - Thanks to all for your prompt payments - If you would like to go on a waiting list for the chance of a ticket next season, then please contact the Earl. Season Tickets and Day Tickets now available to purchase online and also at most of our outlets. Just a reminder that the new season tickets and day tickets will be going into the tackle shops from Tuesday morning. If you buy a season ticket you will automatically be given a new gate key (locks are being changed) - please make sure you do not leave without one! 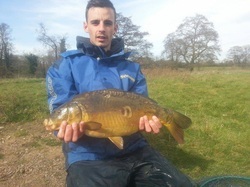 Shane Tooth is having a good session on Woodrow's Pond today - pictured with a lovely mirror. Don't forget existing season ticket holders can fish Woodrow's until the new tickets are available. Website currently being updated so apologise for any interference in service. Tickets will be at the printers next week and will be in outlets (fingers crossed) on 1st April. 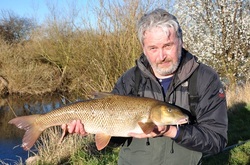 Member Steve Collins landed this beautiful 13lbs 14ozs Barbel today on the stretch. Bailiff Kamil was patrolling and took this photo for Steve. Hope you look at the website Steve and see it! Well done! What a fantastic day on the Earl - The sun shone all day and what an amazing group of guys - 53 Anglers fished the Match, 14 Pike were caught and a few double-figure Pike lost... 12 Anglers caught. The winner of the match and also biggest fish was Tomas Komendzinski with 10lbs. 2nd was Jakub Potrykuswith 9lbs 4ozs, 3rd was Paul Danby with 8lbs 1ozs and 4th was Jarek Dabrowski with 7lbs 3ozs. All received cash prizes plus donated prizes. The raffle for a Predator Fly Rod, kindly donated by The Game Angling Consultancy(worth £325) raised £275 - this money was split between the winners and charity. Over the whole day we have raised £200 which will be donated to a Childrens Cancer Charity. What was amazing is not only did Tomas Komenzinski win the match but his raffle ticket was drawn and he won the Rod! What a day! Many thanks to Pawel Balcerzak, Jarek Biszczuk, Maciej Kowalkowski, John Mansell and to The Game Angling Consultancy for their generous donations. Also thanks to all at the Earl and those stewarding - Teresa Parr, David Parr, David Sharpe, Richard Froud, George Sheldon, Kamil Sulima, John Mansell, Gavin Scaife, Ray Anthony, Dean Anthony, Jonathan Paley, Gordon Lathwell. The Club's 2nd Annual Predator Match takes place this Saturday, 1st March. We have about 50 Anglers taking part so please be aware that the stretch from Alvaston Railway Bridge to Borrowash Road Bridge will be busy. The stretch will not be shut as it is a roving Match - fishing 11am - 4pm. Premium Ticket 2014-15 Season to include exclusivity on Haslams at Derwent Valley Fishery. We have just a few Premium Tickets still available (50 max) priced at £100 (this price is inclusive of all the Earl waters and exclusivity on Haslams 24 hours) - if you are interested and require further information, then please contact the Earl as soon as possible. Our 2nd Annual Predator Lure Match is on Saturday 1st March and is to be held on the river from Raynesway Weir downstream to Borrowash Road Bridge. It is a roving match with either dead baits or lures. Entry is £12 of which £2 goes towards sausage butties pre match. We are registering from 9am and fishing 11am - 4pm. There are a few spaces available so if you fancy a good social day out then get in touch now! URGENT! PLEASE TAKE TIME TO READ THE ARTICLE BELOW PUBLISHED BY THE ANGLING TRUST TODAY - FANTASTIC NEWS! THE EARL NEEDS YOUR HELP IN COLLECTING INFORMATION ON CORMORANT AND GOOSANDER ACTIVITY IN THE DERWENT CORRIDOR - COULD YOU PLEASE GET IN TOUCH WITH WITH ANY SIGHTINGS (WHERE, HOW MANY, ETC) - PHOTOS WOULD BE GREAT IF POSSIBLE SO THAT WE CAN START BUILDING UP A RECORD OF POSITIVE SIGHTINGS. ALSO INCLUDE ANY LAKES NEAR OUR RIVER SUCH AS ALVASTON LAKE. WITH EVERYONE'S HELP WE CAN START TO MOVE THINGS FORWARD. 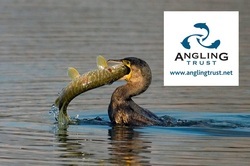 The Angling Trust has concluded negotiations with the Government on the implementation of new measures, announced last year, to improve the protection of vulnerable fish stocks from predation by cormorants and goosanders. The Trust has been campaigning for more than three years for a change to the current bureaucratic and ineffective licensing regime that governs the lethal control of these birds, which can eat between 1 and 2 lbs of fish every day, collectively more than 1,000 tonnes every winter. • Agreement to increase the national limit for cormorant controls to the emergency level of 3,000 (from 2,000 last year) in 2014/5 if the need can be demonstrated. 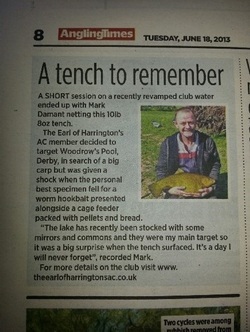 Today's article on Kam's Perch in Anglers Mail. He also wins £100 worth of Korum Tackle. 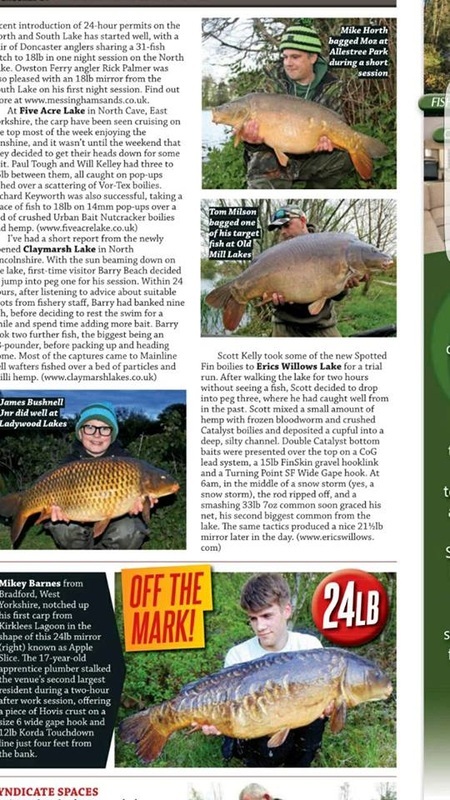 Well done to Kam who features in today's edition of Angling Times. 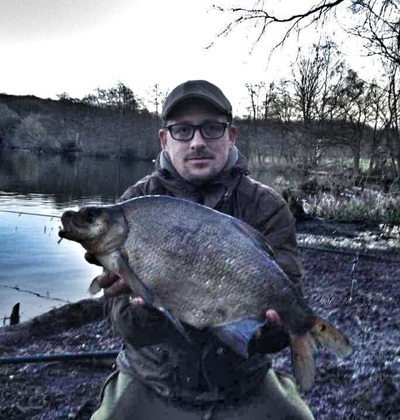 Club Bailiff Kamil Sulima landed a Perch of a lifetime today. Caught on a lure, this whopper weighed in at 4lbs 11ozs. Well done Kam ! As promised the Club continues to invest in the river fishery. 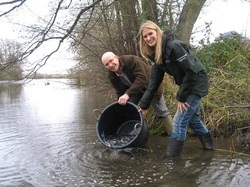 This is the start of an ongoing programme to introduce more silver fish into the river to help nature find its balance. The Earl has today purchased 2,000 4" - 8" Roach from our Fisheries Consultant Andrew Ellis from A E Fisheries and they have been introduced into the Canoe Club Stretch (upstream of Darley Weir). We intend to further improve the pegs along this stretch as accessibility and parking is great. It isn't just about putting fish in but also about habitat creation to improve spawning and provide juvenile fish refuge. Further investment will be made to improve/create additional habitat along our river stretches as we know this is the solution over the longer term. 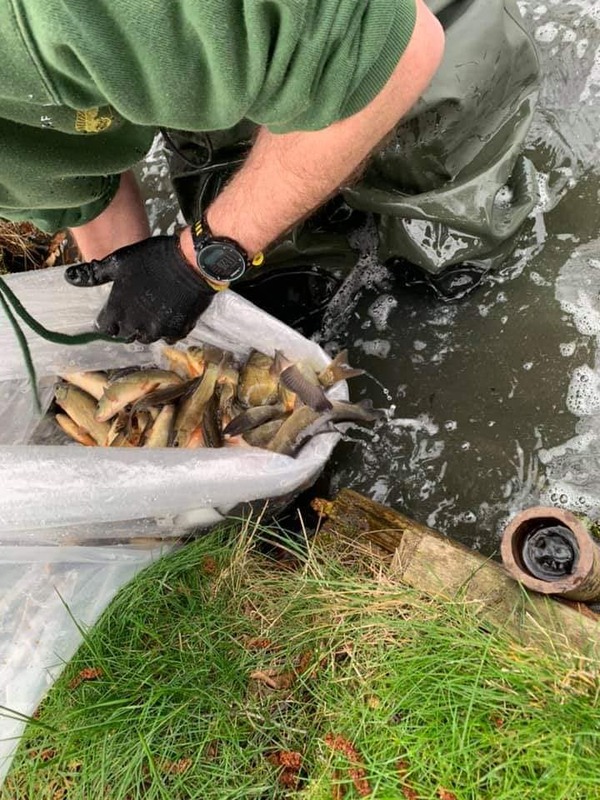 Today saw the Environment Agency (Calverton Farm) introducing 6,000+ fish into our stretch - 2000 Dace, 2000 Roach and 2000 Chublets. Also 100 6" Barbel were put in, this is all in additon to the 10,000 Bream introduced a couple of months ago. 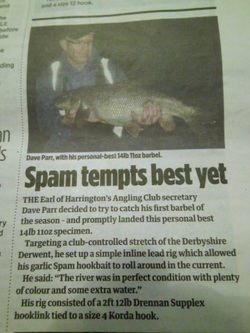 Good to see our very own Club Secretary, Dave Parr in Angling Times. Well done Dave! The Earl's Club Secretary, Dave Parr, landed his dream fish last night, a whopping 14lbs 11ozs Barbel and a Personal Best which is going to be hard to beat. Proves that patience really does pay off - well done Dave! Can members please be aware that the Club is holding an Integration Predator Lure Match this Sunday, 10th November. It is a roving match and 50 plus anglers from all over the country will be taking part. The stretch allocated is Alvaston Park Railway Bridge - Borrowash Road Bridge and will be from 9am - 2pm. UPDATE - As from next season (March 15th 2014), the main lake (Haslams) will be on a separate 'ComprehensiveTicket'. There will be 50 tickets issued at £100 for the season (March 15th 2014 – March 14th 2015). This will give the member exclusive use of the lake (day and night) and all other E of H waters. Each member will receive 5 tickets to invite a fishing guest for a 24 hour session (£10 per session). When setting the price for this ticket we have taken into account the substantial investment we have made this season (re-grading of banks, planting, stocking, feeding the fish, portaloo, grass cutting etc.. . - you can be assured that we will continue to invest. The Club is committed to offering affordable fishing and we will always continue to do so and we are passionate about the fishery . 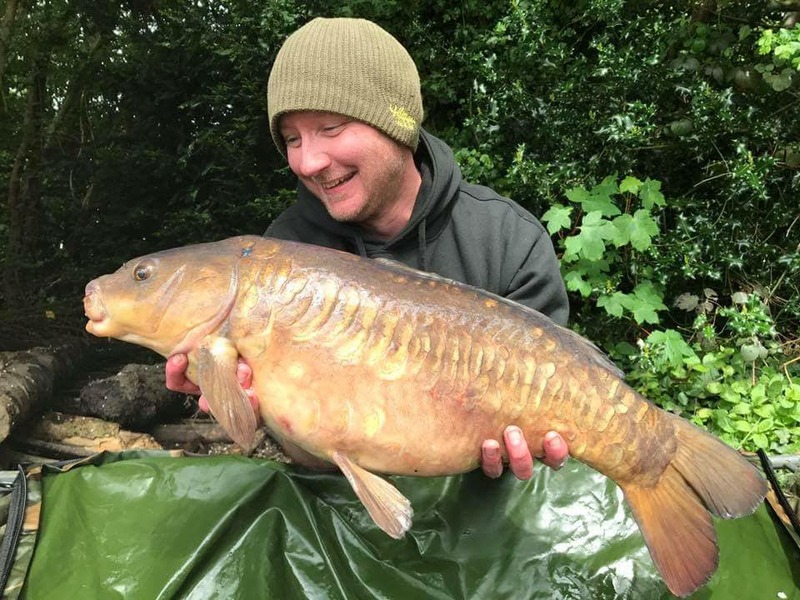 The stock in the lake will be carefully managed and thrive – as you know we have really beautiful carp in Haslams, many of which are the original stocked fish some 30 years old. We are not a Commercial Fishery and never will be. Fish welfare is our top priority. Obviously the current 50 night permit holders will have priority and will be offered the chance to purchase a ComprehensiveTicket first for an initial small deposit before we open it up to people on our waiting list. If you would like to put your details forward to add to the list, then please get in touch. Various options will be available for paying off the outstanding balance before next season. Sunday 10th November sees the Intergration International Predator Lure Match being held on the Earl stretch from Alvaston Park Railway Bridge - Raynesway Road Bridge. This match is being run in association with Polish Anglers Association, Angling Trust and Environment Agency. The draw is between 7.30am and 8.30am in the Blue Jay car park and the match runs from 9am - 2pm followed by a barbecue in our Parlour Car Park Area. If you would like to enter then please get in touch or if you would like to come and help out on the day then email earlofharringtonsac@gmail.com or use the contact page of the site. 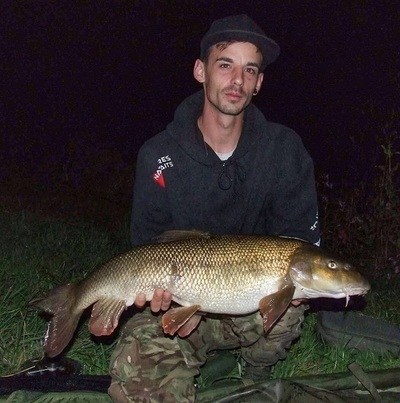 Richard won £100 and an exclusive Barbel Hoodie. £50 will be sent to his chosen charity 'Mind' and £50 has gone to Club Funds. 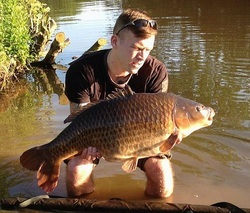 Cracking Common landed by Ben Leeming at Haslams today - 23lbs 9ozs - beating his PB Common by 5lbs. 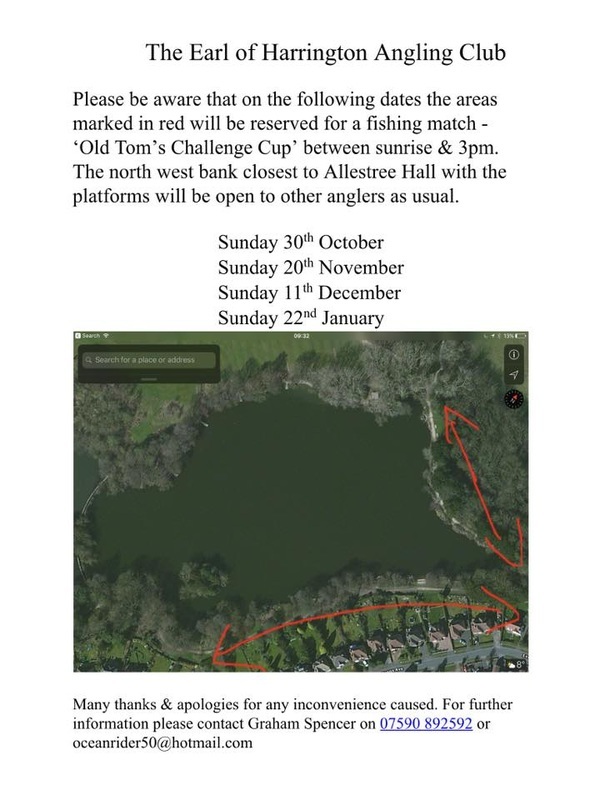 The Earl is delighted to announce that we will be hosting in conjunction with Angling Trust, Environment Agency and Polish Anglers Association the 2013 'Integration Predator Lure Fishing Competition' to take place on Sunday, 10th November 2013. The Earl would just like to let members know that the Environment Agency working with Calverton Fish Farm have this afternoon put 10,000 bream into the stretch, half upstream from sluice gates near Parlour Stretch and half downstream. Onlybabies, between 3cm - 10cm so let's keep our fingers crossed a good percentage survive. We are working tirelessly to improve every area of the fishing for the members and will continue to do so. We are expecting further species stocking at the end of the year and will keep you updated on this. Here are the match results for Riverfest. 1st Phil Foster 9lb 10oz. 2 chub 30 dace, Waggler, stick and small feeder for the 2 chub. Used caster, hemp and piece of small meat. 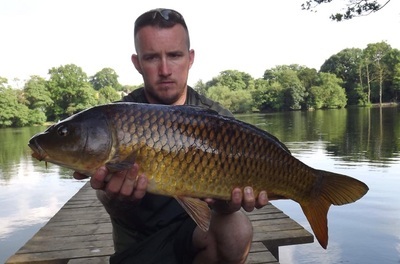 1st Steve Whitfield 4lb 11oz. 1 chub on lob warm, used free line. 1st Matt Derry 6lb 10oz. Used waggler and stick, dace up to 3ozs, bait - 3 pints of hemp and 2 and half pints of maggots. The match was very hard due to low and clear water. 59 anglers fished the match. If you watch East Midlands Today lunchtime/evening you may spot something familiar. 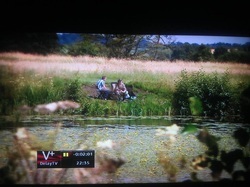 Haslams at Derwent Valley Fishery is featured in this trailer and is being shown throughout Autumn. IMPORTANT NEWS - THE ANGLING TRUST RIVERFEST QUALIFIER TAKES PLACE THIS SUNDAY 1ST SEPTEMBER AND WITH 60 PEGS BOOKED THERE ARE 3 STRETCHES THAT WILL BE CLOSED FROM DAWN UNTIL 6PM - THESE ARE DARLEY FIELDS, 5 ARCHES - ALVASTON RAILWAY BRIDGE AND BLACK WEIR - BORROWASH BRIDGE. IMPORTANT NEWS – DERWENT VALLEY FISHERY – The Club would like to announce that as from next season (March 15th 2014), the main lake (Haslams) will be on a separate Ticket. There will be 50 tickets issued at £100 for the season (March 15th 2014 – March 14th 2015). This will give the member exclusive use of the lake (day and night) and all other E of H waters. Each member will also be entitled to invite a fishing guest for a small fee. When setting the price for this ticket we have taken into account the substantial investment we have made this season (re-grading of banks, planting, stocking, feeding the fish, portaloo, grass cutting etc.. . - you can be assured that we will continue to invest. The Club is committed to offering affordable fishing and we will always continue to do so - we are passionate about the fishery . The stock in the lake will be carefully managed and thrive – as you know we have really beautiful carp in Haslams, many of which are the original stocked fish some 30 years old. We are not a Commercial Fishery and never will be. Fish welfare is our top priority. Obviously the current 50 night permit holders will have priority and will be offered the chance to purchase a Premium Ticket first for an initial small deposit before we open it up to people on our waiting list. If you would like to put your details forward to add to the list, then please get in touch. Various options will be available for paying off the outstanding balance. All night permit holders will be sent a letter in the next couple of weeks with an application form and all the details. We would like to reassure all Season Ticket Holders, that Woodrow’s Pond will remain on the Season Ticket and we are always actively seeking additional waters. As you are aware, Woodrow’s has not been fished much over the last few years, but again we have invested heavily in the pond and more investment is earmarked for next season. We are getting many anglers this Season that are going down to the Pond and really enjoying their sessions. We look forward to a great future for the Club, both at the fishery and on the river. The Earl held its first Barbel Match tonight. 33 entries - 50% payout. The winner was Eathan Waddington, second Ian Ong and third Richard Brady. A great night was had by everyone and £85 also went to Eathan's chosen charity of 'Help for Heroes'. See photo gallery River Derwent for photos of the match. 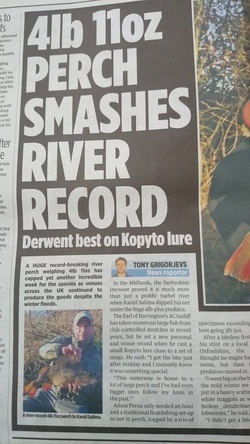 As reported the Derbyshire Derwent Barbel Record was broken a couple of weeks ago by Ian Hartley and has now been verified at 16lbs 12ozs. 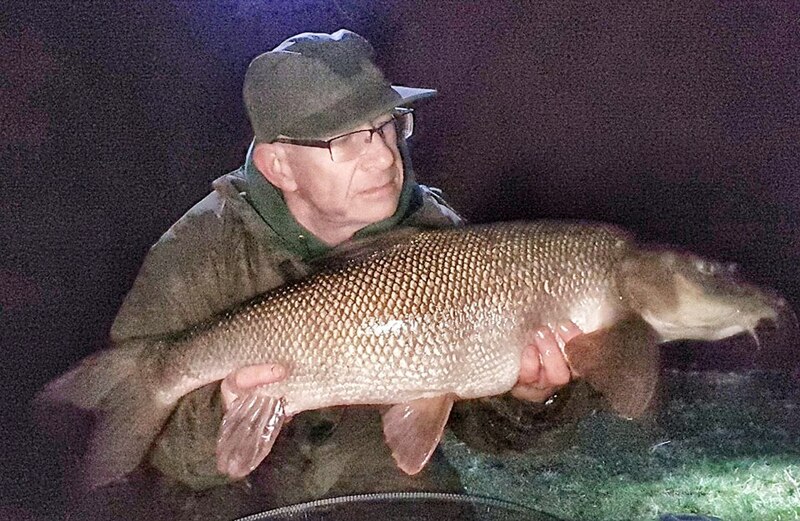 Tonight Wayne Tooth landed this 17lbs 4ozs Barbel which is a new PB and a new river record (not yet verified). The code for the combination lock for the Parlour Car Park has changed. This is because of 2 padlocks being stolen in the last couple of weeks. If you would like the new code then please message the Earl via the contact page and state your season ticket number. The Derbyshire Derwent Record was broken last night when Ian Hartley landed this monster at 16lbs 12ozs!!! 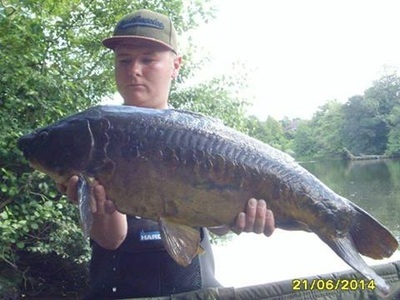 29th june 2013 - new article from clint walker on website - take a look! The Pond will remain closed until further notice and we sincerely apologise for this. 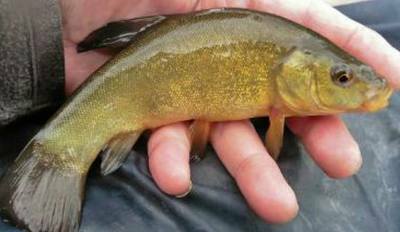 The newly stocked carp have been spawning erratically due to weather conditions and we are now experiencing some mortalities. We are constantly in touch with Andrew at AE Fisheries and he has prepared this statement for our members. With regards to Woodrow's Pond, as with many venues over the last few summers, the carp are struggling to deal with the ever changing temperatures. It happens all over the country, the fish prepare for spawning, the most stressful time of the year, the temperature creeps up to 18 degrees. Just as this happens the weather changes overnight, and the temperature drops sharply. This causes the fish more stress (correct temperature is key to successful spawning) this leaves the fish in a bad state. Anglers need to learn that mortality, marked fish, lethargic fish at this time of year is seldom disease, but a result of the stresses of spawning. Last year I went to over a dozen venues that struggled, most lost quite a few fish, which is always annoying, but it does happen. Woodrows is the first venue i have stocked my own fish into where this is happening. When the fish went in they were feeding and getting caught, which is the sign we look for to ensure they have settled. Now a few mortalities have occurred. The members should not worry, but try to learn and understand about fish before commenting. After the spawning period (which is totally temperature driven) all will be well. The lake may be closed for periods of time for the coming weeks, but be assured that after the spawning period, if we get some normal summer weather, the lake will fish very well for the rest of the year. If any members have serious questions regarding fish health etc they can pm me. The Earl promises you will be kept up-to-date with any news. wE HAVE A FEW SPACES LEFT FOR THIS MATCH - VERY SOCIABLE - PRIZE MONEY, CHARITY DONATION, RAISING MONEY FOR CLUB FUNDS, SAUSAGE AND BACON BUTTIES - HOW CAN YOU RESIST??!! GET IN TOUCH NOW IF INTERESTED VIA CONTACT PAGE. Woodrow's Pond remains closed. 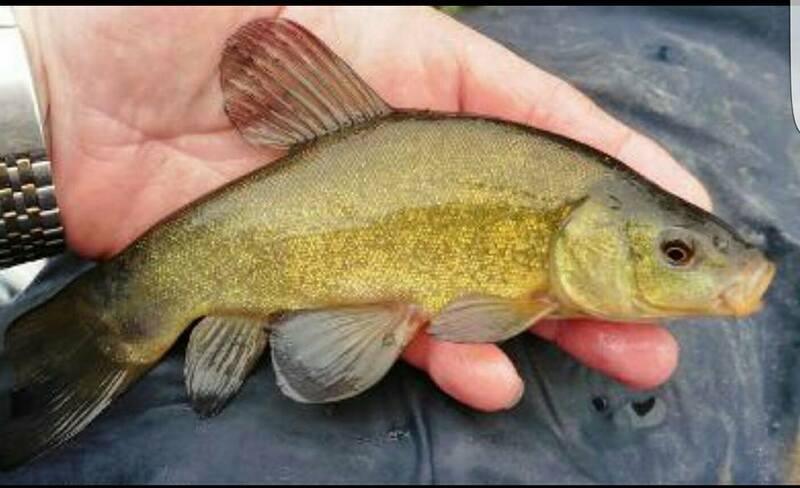 The specimen Tench have just begun spawning. We will keep you updated. The Chub and Bream have began frantically spawning this morning in the Alley and the Barbel will follow. The Club recognise that this is a special place and an important spawning area in a confined space. For this reason CHUB ALLEY IS CLOSED UNTIL FURTHER NOTICE - we apologise for any inconvenience caused but Fish Welfare is our top priority once again. The main river remains open. 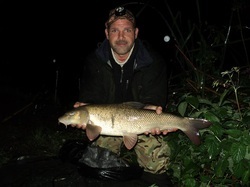 Another fantastic Barbel landed last night by Member Ray Francis - weighing 13lbs 3ozs. 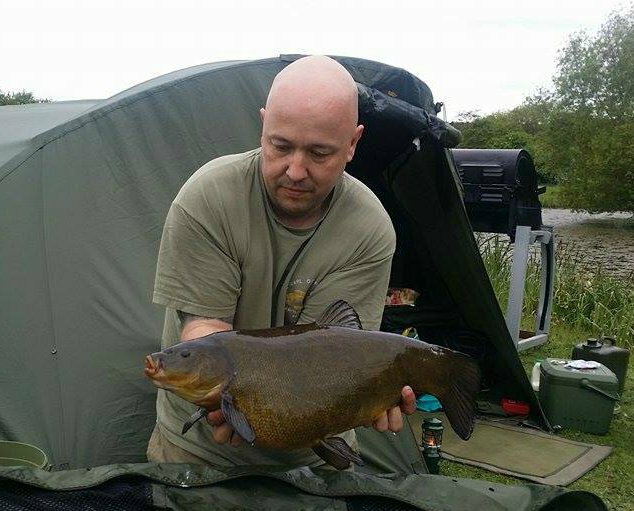 Ray used 14mm Halibut Pellets and Ground Bait. 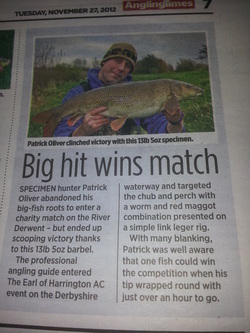 Double Bubble in Angling Times today! 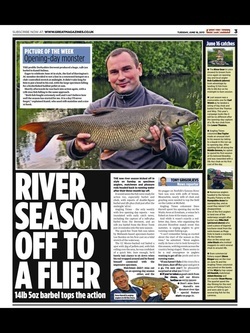 The Earl is in this week's Angling Times - page 3 - best barbel on opening day - well done to Kamil Sulima! Check out the Photo Gallery - River Derwent 2013-14 Season - amazing first day and this is just from the guys and girls that take photos and send to the Earl. Would love to get as many catch photos as possible (no matter what the size) so please email them to the Earl at earlofharringtonsac@gmail.com ! What a start to the season - cracking first day (see photo gallery). Shown is Kamil Sulima (Bailiff) with a stunning 14lbs 5ozs Barbel caught on the Pride Park/DW stretch. Many hours of hard work have been put in during the closed season on the stretches by very dedicated guys - all worth it when you land a special fish like this! Woodrow's Pond at Derwent Valley Fishery is closed until further notice. This is due to erratic weather conditions and spawning of the newly stocked fish. We apologise for this but fish welfare is our top priority. Brilliant day yesterday at our final work party before the new season - check out the photos in the Work Party section. A new combination lock has been fitted to the access road to the Parlour Car Park. The code is the same as last season. Any new members that are unsure of the number then please get in touch via the contact page quoting your season ticket number. Derwent Valley Fishery - Just to make everyone aware, we expect that the fish will be spawning imminently in Haslams and Woodrows Ponds. As soon as this happens we will be closing the fishery until spawning has ended. Fish welfare is top priority and we have some special fish in the ponds. We will keep you updated when this happens. As you know Woodrows has now been stocked with commons and mirrors and they have settled in quickly and are now being caught. 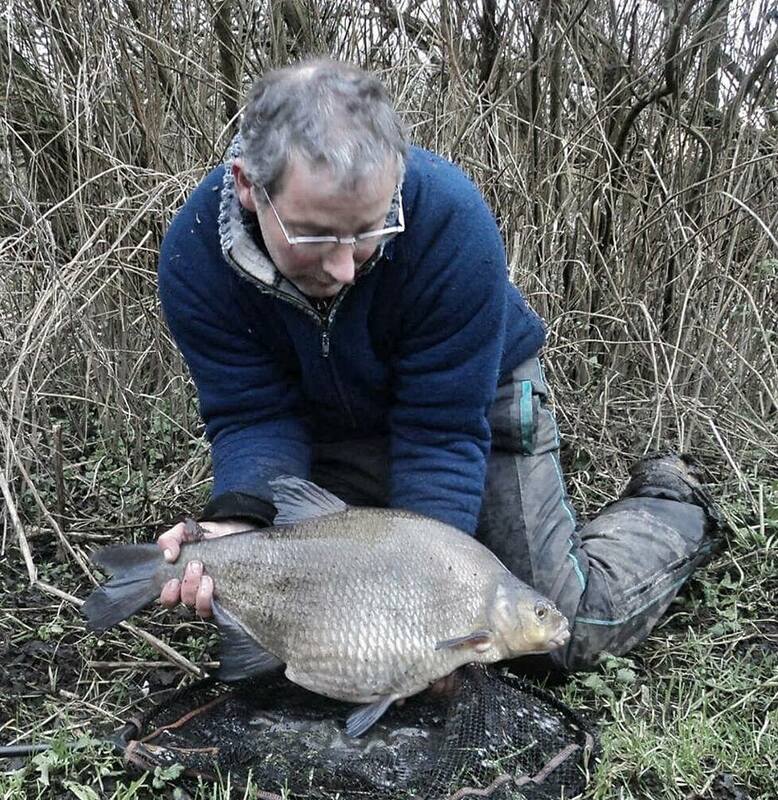 The excitement of the weekend is Mark Damant landing a 10lbs 8ozs Tench out of Woodrows - very special! There is still work to be finished so please respect the bank etc. You may drive up to Woodrows but please park on the left hand side of the pond - Do not drive around the pond. Please fish from the designated pegs. No nuts of any description. We need to record the fish caught so please get in touch with your catches. The Main Lake (Haslam's) will re-open on Thursday 23rd May at 9am. Please be respectful of all the hard work that has been done with regrading, seeding and planting. It is early days and everything needs time to settle in. Woodrow's Pond will remain closed. The new fish are due to go in soon, we will give them a few days to settle and then it will re-open. In the meantime, bank work still has to be finished, seeded etc.. Will keep you fully updated on the Pond. 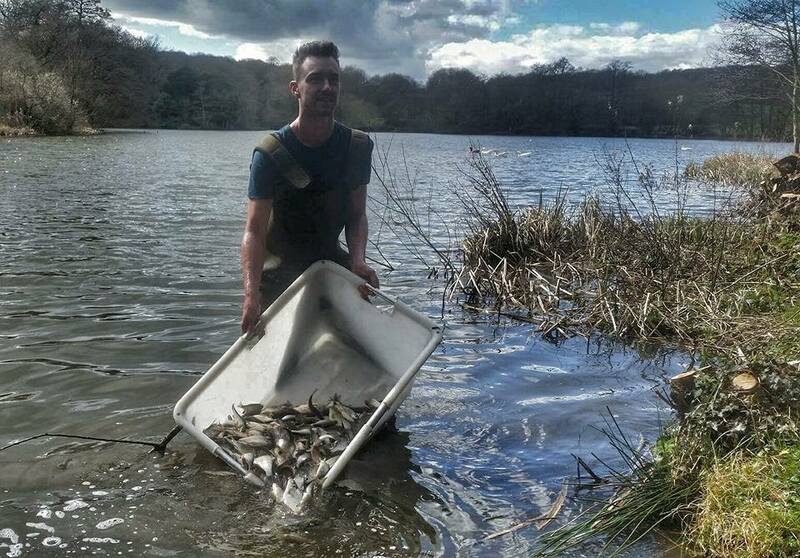 Update on Derwent Valley Fishery - Both lakes are closed until Monday 20/5. This week will have seen all banks regraded on both lakes. Major planting has taken place on Woodrows and we will be stocking with cormorant proof carp within a couple of weeks. The main lake has partial planting and is work in progress. Given time they will both look amazing! 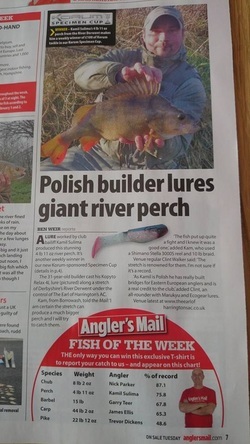 We are featured in this weeks Angling Times! Another brilliant week at Derwent Valley Fishery - over 20 fish landed to include 20lbs 3ozs fully scaled mirror caught by Mark Harrison, 18lbs 12ozs mirror by Karl Allen and a 8lbs 7ozs Tench by Ian Hartley. Pictured is new member James Dowd - he had a session on Saturday for the very first time and landed this 9lbs 8ozs mirror. As you can see from the smile on James's face, he was very happy! 2 further work parties announced and we welcome members and non-members to come and join us. On Wednesday, 8th May we are meeting from 4.30pm onwards at the car park by the BMX track, Meadow Lane, Alvaston. We will be clearing pathways through the trees there and also improving pegs and litter picking. 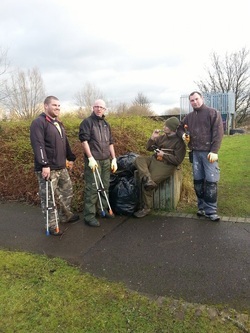 The second work party is to concentrate on Basses Rec in Derby City Centre, again to litter pick and improve the bank and pegs ready for the new season. This party will be taking place on Wednesday, 22nd May again from 4.30pm. Please get in touch if you would like to come along - you will be very welcome! 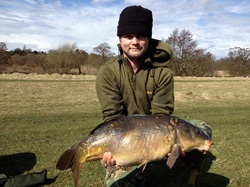 On the 15th April, Ricky Cross had his PB of a 17lbs 5ozs Mirror Carp. Ricky has broken that record and today landed this magnificent 20lbs 8ozs fully scaled Mirror Carp. What a cracking fish - well done Ricky! The bailiffs will then be alerted - The Club will not tolerate any illegal fishing! 17th April 2013 - Our 3rd work party on the river from 5 Arches Bridge to Alvaston Railway Bridge. Thanks to everyone who turned up. Have a look at the photos in Photo Gallery - River Derwent. Member Ricky Cross landed his PB today with this fantastic 17lbs 5ozs Mirror Carp - well done Ricky! 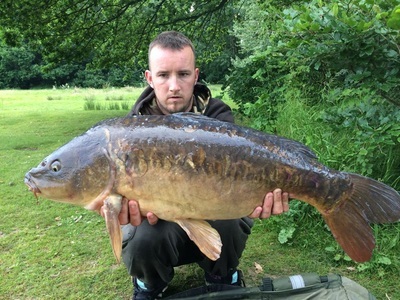 DERWENT VALLEY FISHERY REPORT - This weekend has seen 10 fish out of the main lake with 5 being landed by Karl Allen (pictured), which included a target fish of a 20lbs fully-scaled mirror. Karl also landed a 7lbs mirror, 15lbs common, 15lbs 12ozs old mirror and a 17lbs 8ozs mirror. Karl is a new member this season and also has a night permit for the main lake. Not a bad start to the season! 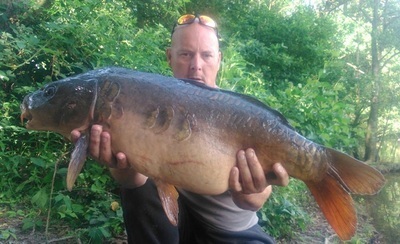 Dave Paddy Butler landed 2 fish, again a new member this season. Today was his first session at the Derwent Valley and he landed a 15lbs 12ozs common and a 15lbs common. Well done Dave. Dean Malenko, again a new member landed a 15lbs common. 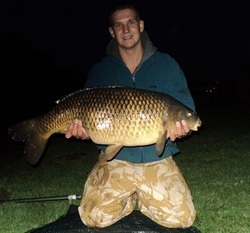 Jonny Fowlke had a lovely 13lbs 7ozs common while Dan Golding landed a 14lbs 4ozs common. Derwent Valley Fishery - First fish of the season out this morning. Members Jon Fowlke and Dan Golding both landed Common Carps this morning. 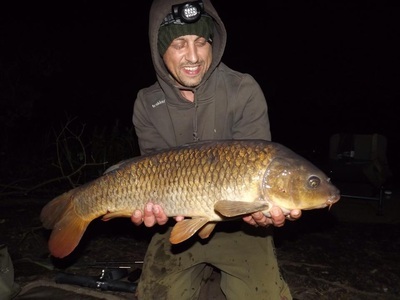 Jon and Dan both have night permits to fish the main lake and arrived yesterday afternoon in freezing conditions. It paid off for both of them with Jon landing a 19lbs 9ozs beauty (as left photo) and Dan an 18lbs 9ozs. 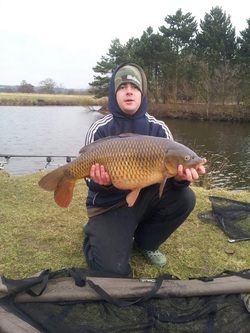 Well done lads - photos added to Derwent Valley Fishery Photo Gallery. Our Head Bailiff, Jason Palmer is back home after 36 hours at Derwent Valley. The Club must remind everyone that the gates to the fishery must be LOCKED AT ALL TIMES. 3 times the gates have been left open, and when Jason left the fishery the main gate was wide open!!! There are sheep and lambs in the field surrounding both lakes and everyone must realise the importance of gate closure. The rules clearly state that gates must be kept locked and any member/members not doing this is/are breaking the rules and, as such, the Club reserves the right the return of you tickets with no refund being made. 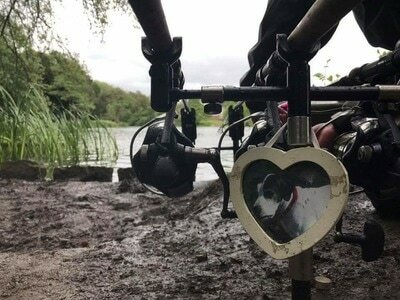 22nd March 2013 - Derwent Valley Fishery - we have now sold all 50 night permits (full allocation). For night permit holders use, we are having a Porta Loo delivered to the Fishery next week and will remain there until the end of October. 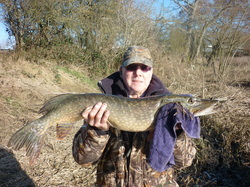 Club Member, David Hind landed this 9lbs Pike on the last day of the season, caught on maggot and worm! Well done David. 6th March 2013 - Season Tickets 2013-14 - the Earl will be at Derwent Valley Fishery this Saturday, 9/3 to take payment for season tickets/night permits for the lake. Season Tickets for the 2013-2014 have now been received from the Printers. We have updated the tickets and alongside have produced a new, easy to follow map of our stretches (all identified and to be used in conjunction with information in the ticket). These will be available to purchase in tackle shops shortly or you can purchase via this site using paypal. The Earl's 1st Annual Pike Match held on Parlour/Deeps Stretch. We started the day with bacon & sausage butties which went down very well. It was a roving match, the draw was made and everyone set off..... Static dead baits proved more successful than the lures. 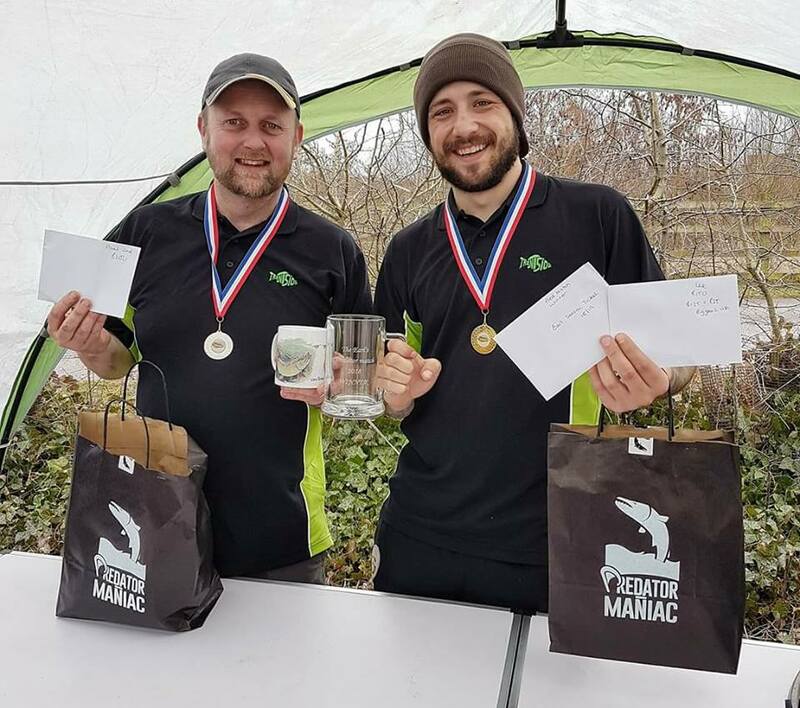 Mark Harrison (pictured left) won the match with a total weight of 16lbs 12ozs (2 pike 9lbs 4ozs and 7lbs 8ozs). Second Place went to Gary Pepperday with a 12lbs Pike (also won biggest fish). Richard Froud had a 9lb 6ozs Pike, Matt Pepperday 9lbs 4ozs, Ian Hartley 8lbs, Christian Holmes 7lbs 3ozs and Jason Palmer 7lbs. 50% of the entry money was paid out to 1st & 2nd and Biggest Fish. 25% is going to the charity of Jason's Mums choice (Jason's Dad sadly died yesterday after a long illness)and 25% will go towards Club Funds.... Everyone left very happy and cannot wait until the next one! New beginnings at Derwent Valley Fishery. Today saw 13 beautiful Common Carp being introduced into the main lake. This is the start of a long-term management plan for the two lakes, not only in stocking, but maintenance, planting etc. We will be holding regular work parties and anyone wishing to get involved then please get in touch. We welcome your support. 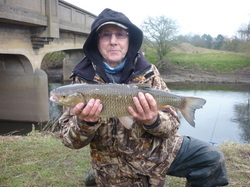 Member David Hind with his PB Chub caught today weighing 5lbs 14ozs. David caught the Chub on size 18 hook, feeder fishing with red maggot. Our Personalised Club Clothing is now available to order - please check out our new page! The Club would like to advise members that we have exclusive rights on the River Derwent at Darley Park and Darley Fields. This stretch is not 'shared' with the Council. We will be doing work on trees, etc to improve pegs, putting up signs and bailiffing. Members Car Park at Borrowash - Please be aware that the car park is extremely muddy resulting in a few cars getting stuck... We are looking into getting some scalpings down shortly. Please use the first car park (which is attached to the main car park). It has a secure gate on it now with the same lock (used to be the old day ticket car park) - no one uses it and it has a solid surface - small ramp at beginning. Once you are in at the back of the car park by river is a pedestrian gate (same lock) so you can get straight onto the river. Problem solved in the short term. The Club's new logo - hope you all like it! We can now begin sorting out some quality hoodies, polo shirts, t shirts, fleeces, caps, beanies for you to purchase. WE CANNOT CONNECT TO ALL MEMBERS VIA THE WEBSITE/FACEBOOK - SO PLEASE SPREAD THE WORD! 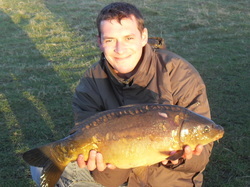 22nd January 2013 - Patrick Oliver had his PB Chub at 6lbs 6ozs on our waters today - beautiful fish - well done Patrick! 21st January 2013 - We are adding 2 new tackle shops to our list next season and you will be able to purchase your Season/Day Tickets from the new outlets. 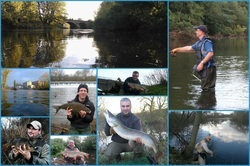 These are Alfreton Angling and Soar Tackle at Kegworth. Ticket outlet page to be updated shortly. Derwent Valley Fishery Night Fishing. 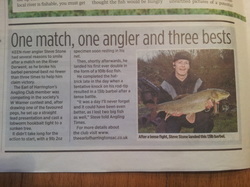 Club Member, Steve Stone, is featured in this week's Angling Times - take time to read Steve's amazing match result! It will be an enjoyable and social day with a chance to meet new people! 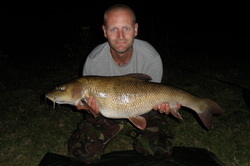 10th January 2013 - Check out 'How to get more out of your Winter Barbel Fishing' Parts 2 & 3 on the website. The Club is launching a personalised clothing range and various items will be available to purchase very soon. These will include high quality hoodies, fleeces, polo shirts, t-shirts, caps etc and will be available in a choice of colours. 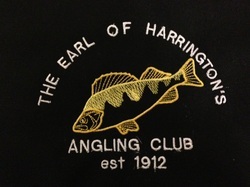 All garments will display the new logo for The Earl of Harrington's Angling Club on the front left chest which includes a Perch image. You then have the option to have a fully embroidered Perch, Barbel or Chub image on the reverse. If you are interested in purchasing an item please get in touch at earlofharringtonsac@gmail.com or through the contact page. 9th January 2013 Do you have any old fishing photos from days gone by? Looking to produce a photo montage including any stories you fondly remember. Could be about yourself, or parent, grandparent, friend etc.... Doesn't have to be on the E of H waters. Please get in touch via email at earlofharringtonsac@gmail.com or through the contact page. Would be great to hear from you. 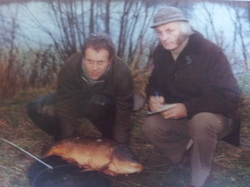 John Parr (Chairman) who had this 21.5lbs river carp in 1980 whilst fishing a Club match. John was pegged just upstream from Raynesway Bridge (Alvaston Bank). He also landed a 1lbs 14ozs roach. John remembers the day well. 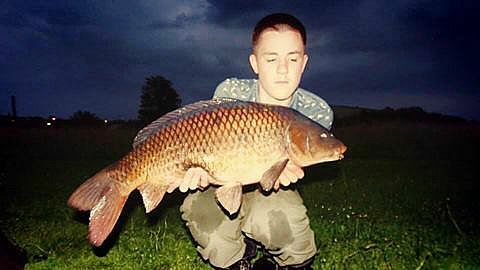 He fished 1.7 hook length and it took him 1 hour 15 mins to land the carp. He is pictured with Walter Hughes (Reporter from the Derby Evening Telegraph). 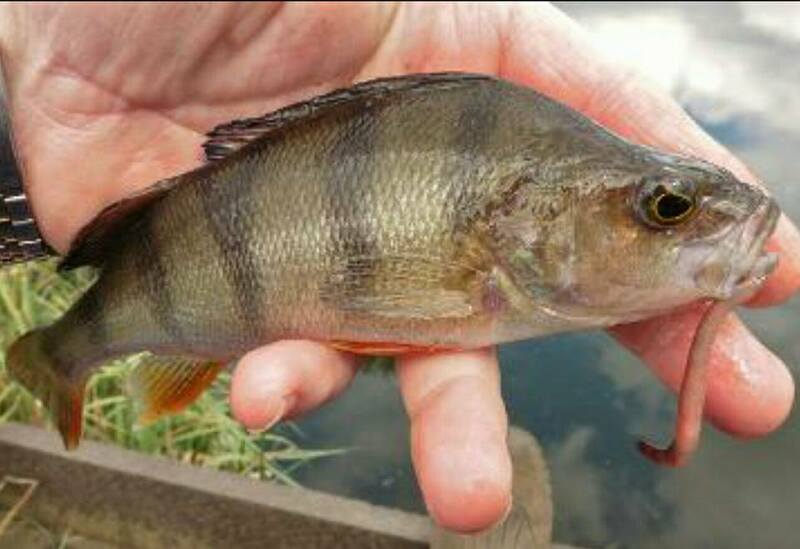 Member and Bailiff Jim Sneap netted 5 fantastic Perch with a total weight of 15lbs 2ozs (All Perch over 3lbs) - Jim also lost a monster Perch... (view Jim's Catch in Photo Gallery). Also caught on the match was a 3lbs 12ozs Perch and a few Chub, one of which was over 4lbs. 21st November 2012 - LODGE SPECIALIST BAITS have been in contact today and are offering exclusively to The Earl of Harrington's Angling Club Season Ticket Holders 10% discount on their high quality baits (except Session Packs). 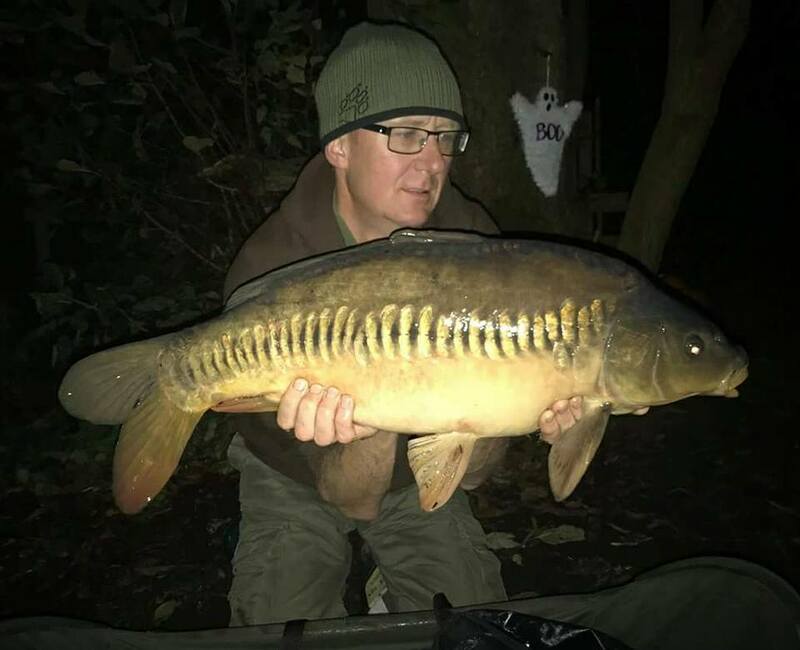 Thank you for your support Chris, and if any member is interested then have a look on the website www.lodgebaits.co.uk or phone Chris direct on 07886 366617. What a fantastic day - after rain overnight and early morning it eventually cleared to leave a mixture of sunshine and cloud. We met at 8am and after getting to know each other, pegs were drawn and the anglers set off to their pegs. The whistle sounded at 9.30 and the match commenced. The Cutting stretch looked great with a good level and a little colour but was difficult for waggler fishing as there was a downstream wind. Sausage and bacon butties were ordered and cooked to perfection by Dave Parr (Secretary) and hand delivered to the anglers - not bad eh! Fishing is always difficult at this time of year and it proved so today. It was always going to be a tough match where a big fish may win it. Jonathan Paley and Anthony Carroll's lines were both broken early on by big fish. Patrick Oliver won the match with Craig Halksworth second and Daniel Tunstall and Tom Noton came joint third. Craig had a weight of 1lbs 2ozs, catching grayling and Daniel and Tom with a hard-earned 2.5ozs. 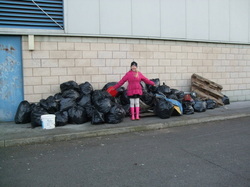 We returned to the car park and presented the great prizes that had been donated for this match. Thank you to everyone involved. The raffle was drawn for the 2013-14 Season Ticket and Matt Pepperday won. Well done Matt and will be in touch as soon as the new tickets are printed. As Patrick won the match it was up to him to choose a charity for the match fees and raffle monies. Patrick has recently raised money in the The Everyman Charity Barbel Challenge 2012 and this is the charity he chose today. We managed to raise £80 for this great cause so thanks again guys! 7th November 2012 - Check out Clint Walker's most recent blog on the www.pallatrax.co.uk site - 'Clint gives his first impressions of a new stretch of the Derbyshire Derwent' - Brilliant Article!